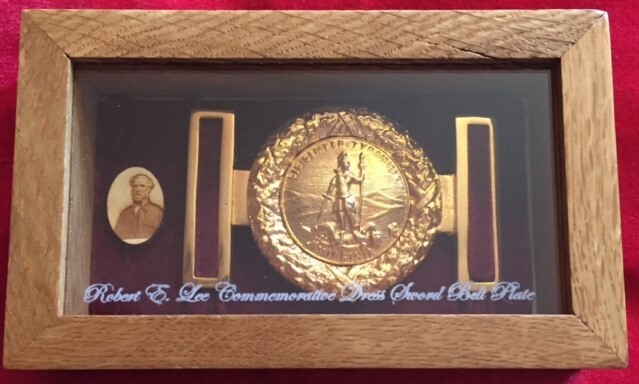 History of the wood display box for the Robert E. Lee belt plate on the far right. Only three display boxes were made from this Lee Tree. 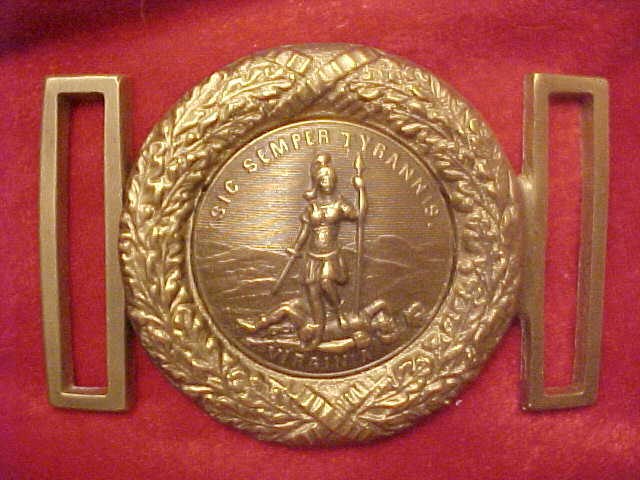 TG-(MOC-LEE) Robert E. Lee Belt Plate. 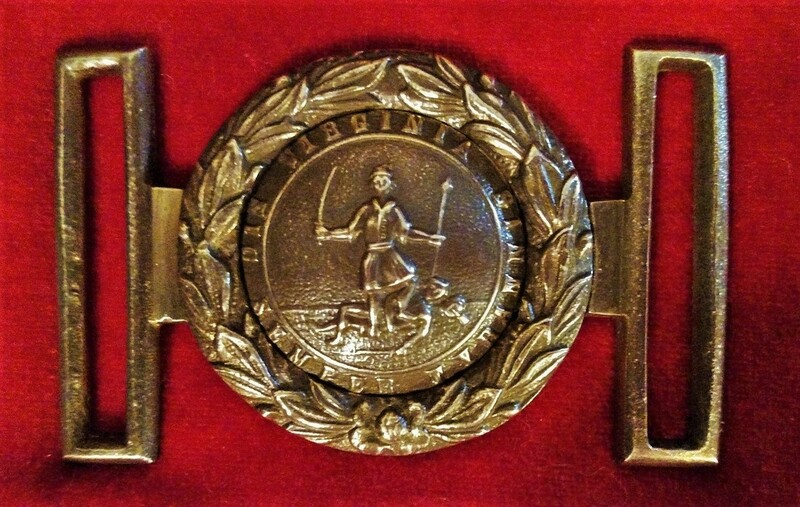 Copied from the Lee buckle displayed in The Museum of the Confederacy and worn by Lee 1861-1865. 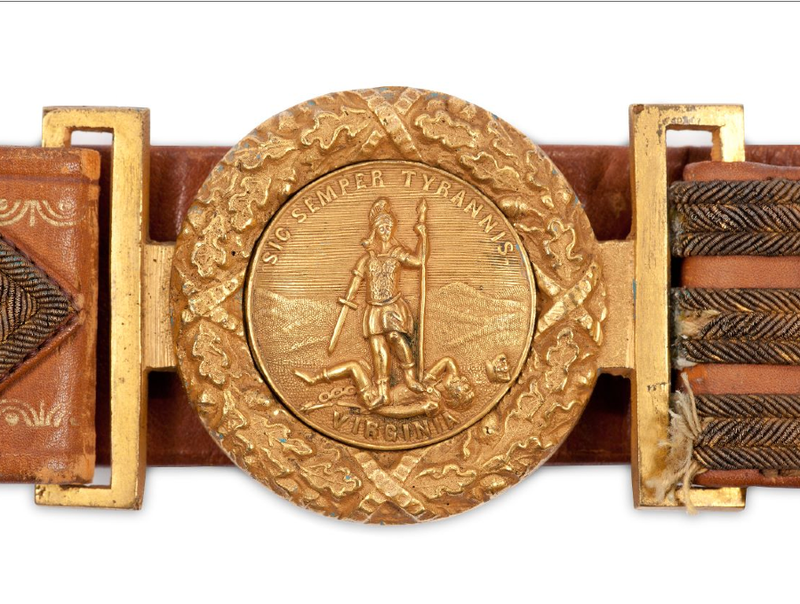 You can only buy this reproduction Lee buckle at the museum. 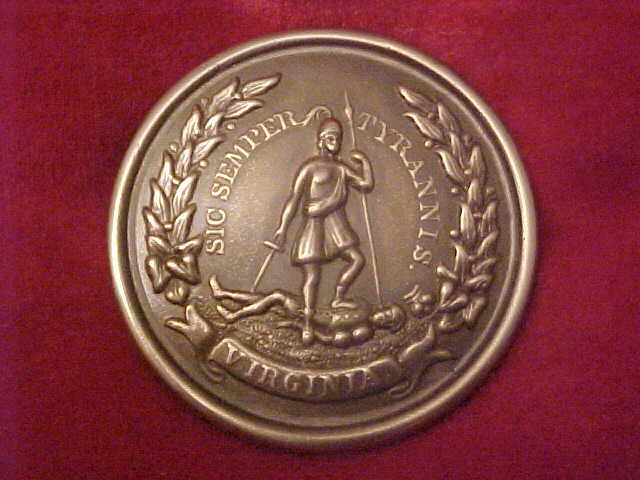 The Lee Virginia seal is NOT the same as the Smith Virginia seal. The A in the Virginia at the bottom of each disc is placed different. On the Lee disc the A is between the shoulder and head and on the Smith disc the A is under the shoulder. 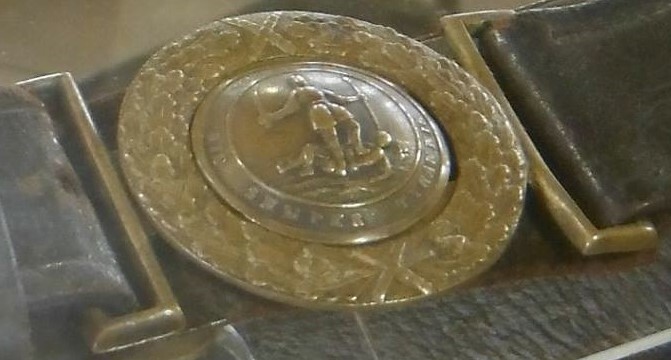 The disc was also applied over another tongue on the Lee buckle. Also has a different style wreath. Probably a C.S. and special made for Lee. 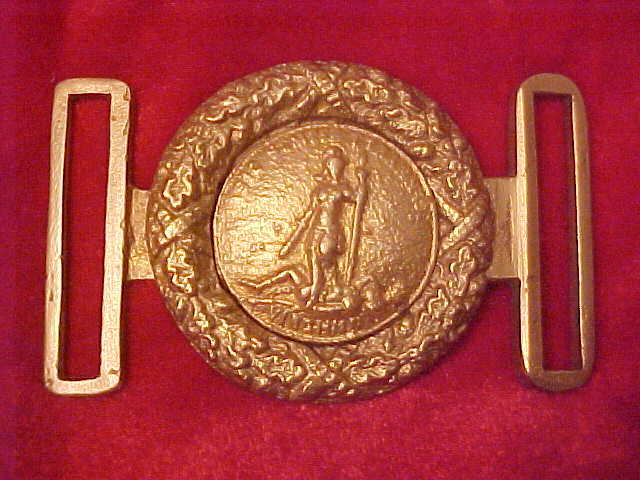 Hanover Brass Foundry (GW) reproduction sand cast from the above Lee original. 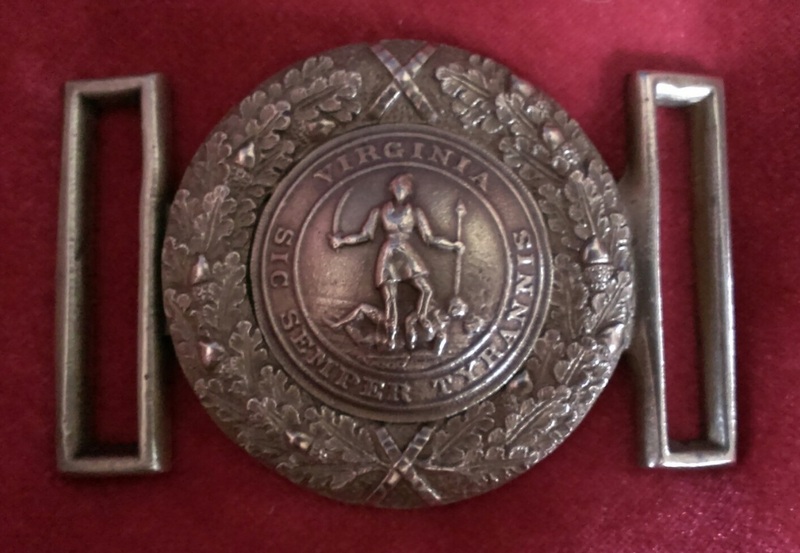 T-114 Virginia two piece Belt Plate James S. Smith & Sons, New York (original maker) Circa 1851. 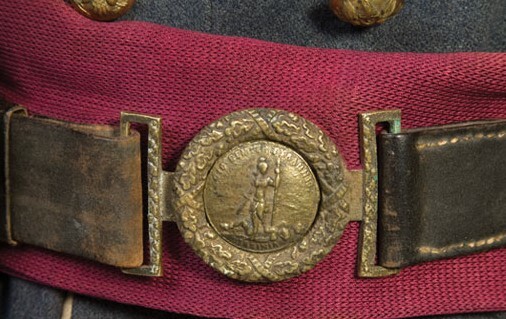 Acorn and oak-leaf design on the belt loops. 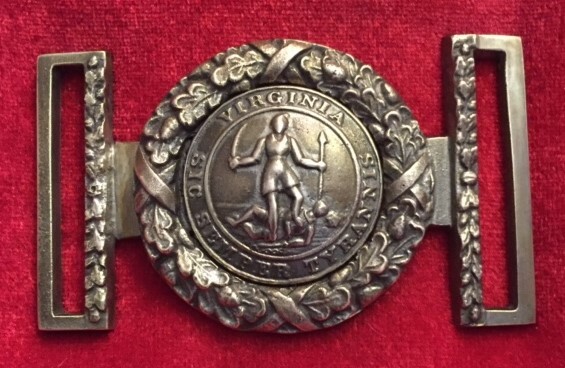 Lee's Virginia two piece belt plate on the left has a different state seal design and wreath. 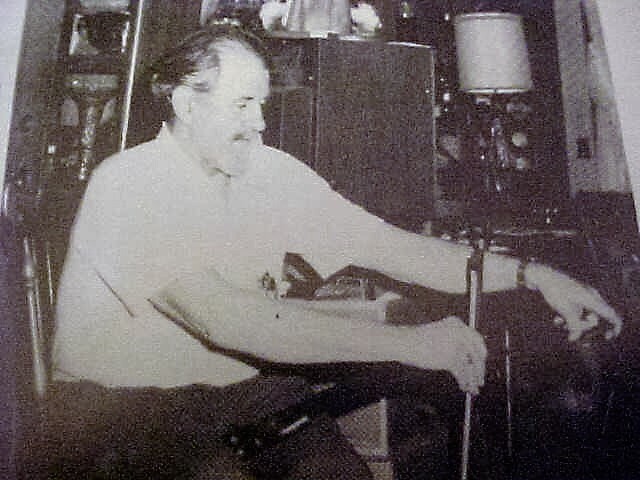 Photo of Mac making music with the handsaw. 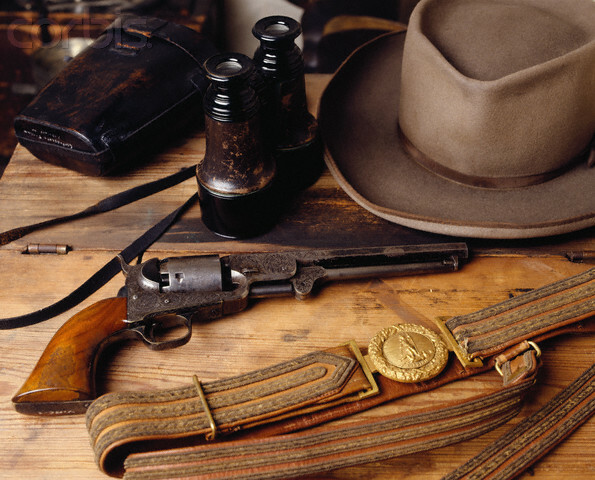 Mac Mason was a collector, relic hunter and author. 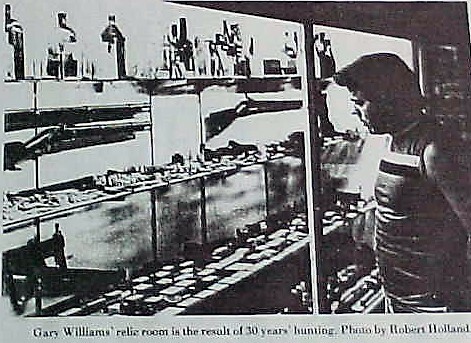 His bullet collection was unreal. Steve Henry now has this collection. Steve and Mac was the best of friends. 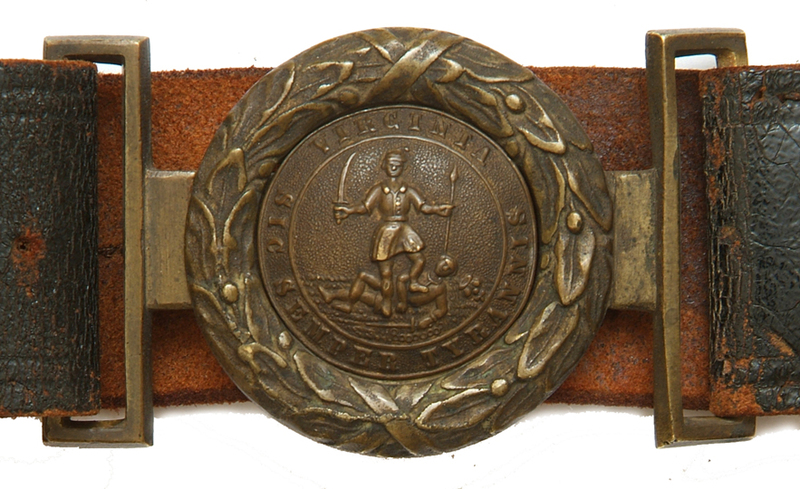 Confederate cast original Virginia belt plate on the leather belt. 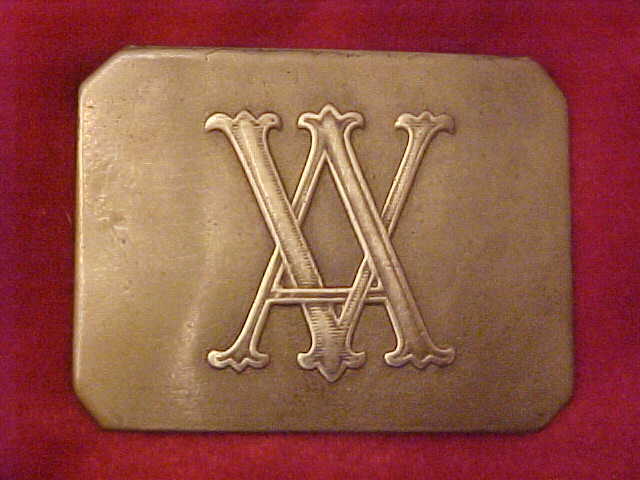 Cast from a belt plate T-114 Virginia pre war buckle pictured above. "Tongue" and the "wreath" is the same type as TG-(VACSMASONTP) pictured below the TG-86, three rows down. 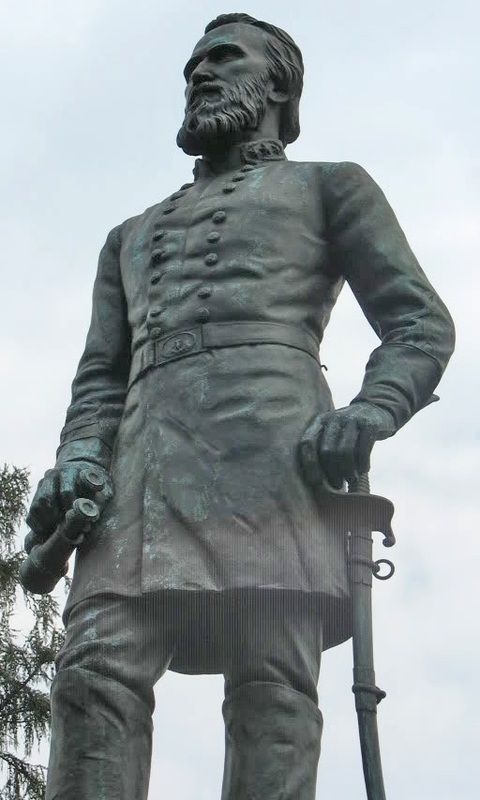 You can see the lost detail from the Confederate Foundry and the many flaws. This was because of the course molding sand used to cast cannons and large items. 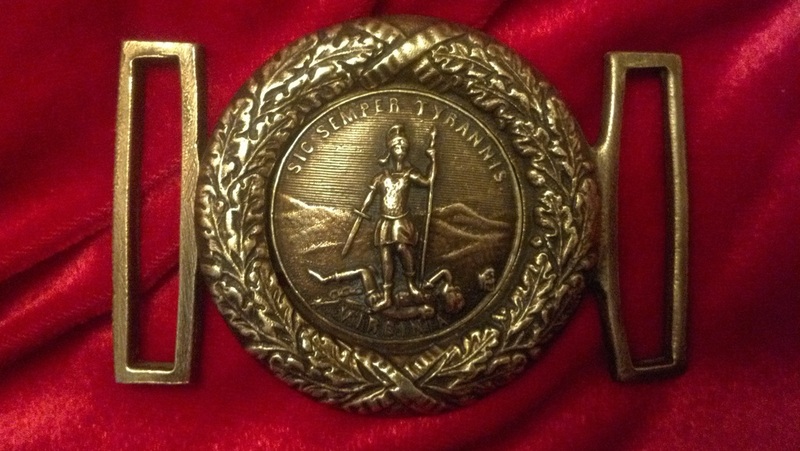 Same sand was used to cast these belt plates and would not get the fine detail on these pre-war buckles. 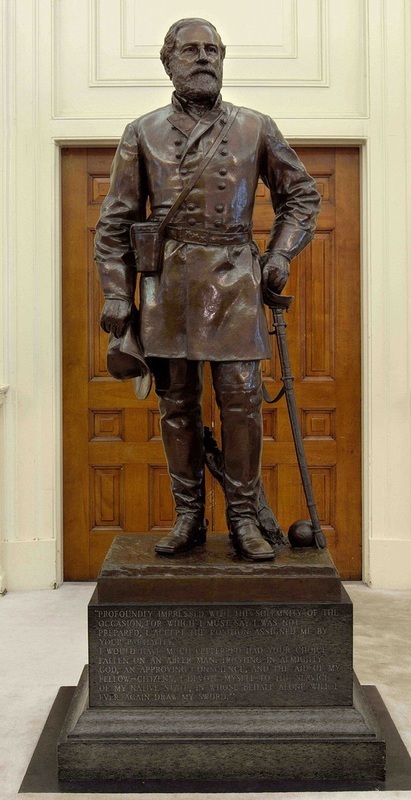 The TG-CS-Virginia Two Piece below was also cast in the same Confederate Foundry. 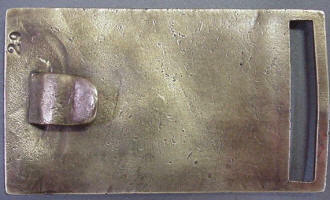 Original used to cast the confederate cast Virginia two piece below. 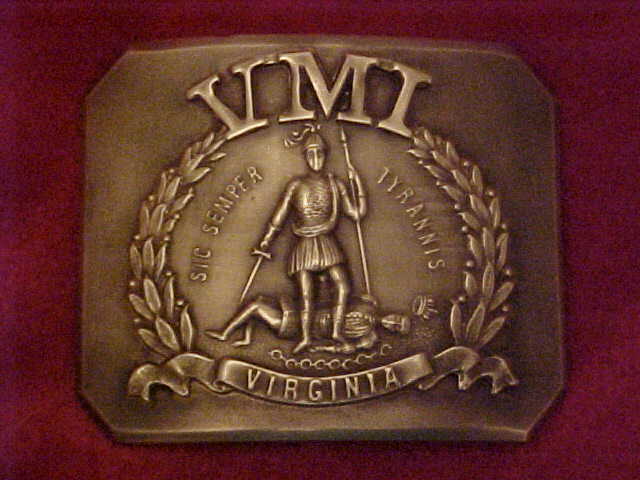 Mac Mason's original Virginia two piece belt plate. 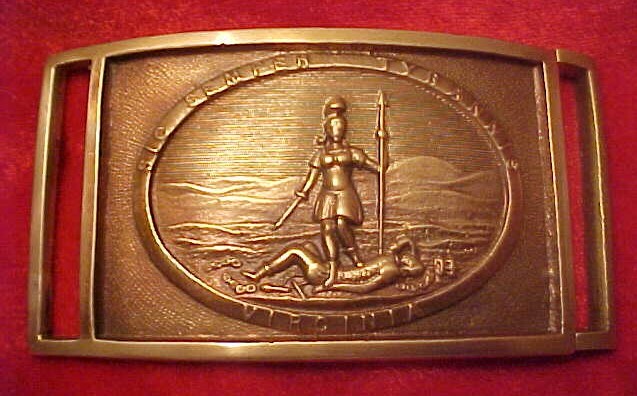 This is the belt plate that made my reproduction business grow into what it is today. T-114 Virginia two piece is the pattern taken from this original in 1968. I give Mac credit. He was the first to let me copy his buckle collection. 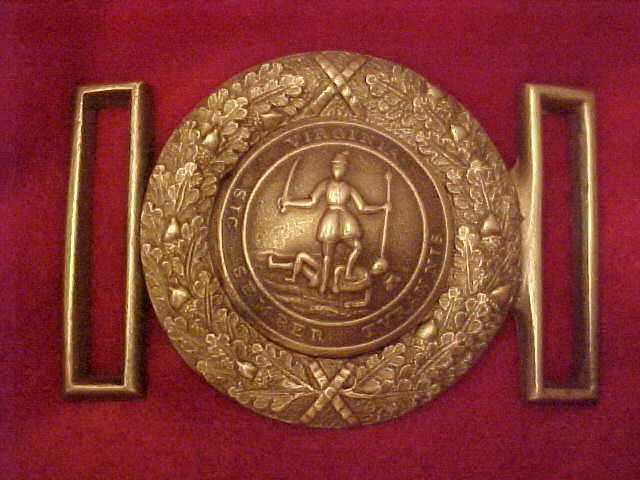 He had many belt plates that were the first reproductions to be sold. 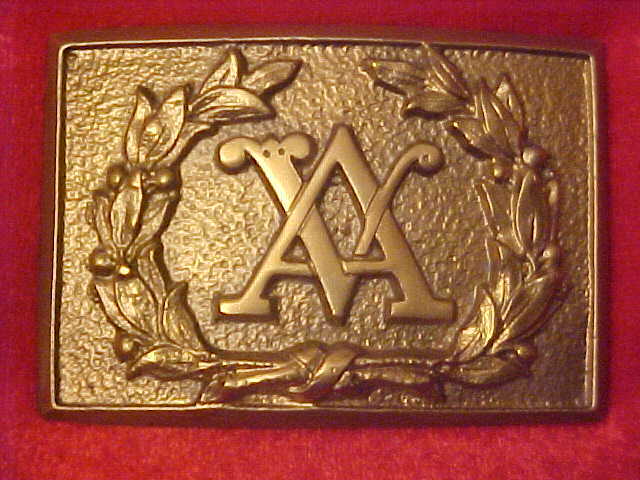 TG-MMVA Virginia Two Piece Belt Plate Circa 1861-1865. Variant of the T-114. 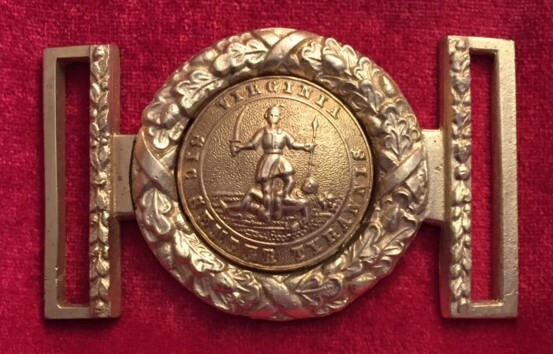 Only difference is the belt bar design and the Virginia seal is sharper details. Cast in Nickel Silver. 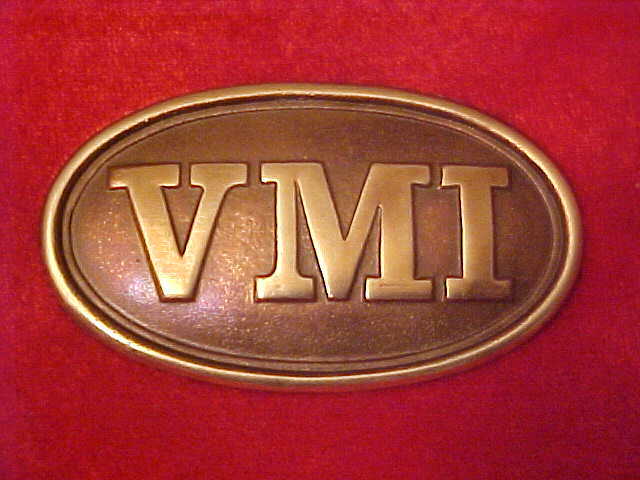 TG-MMVA, Virginia Two Piece 24kt Gold Plate. 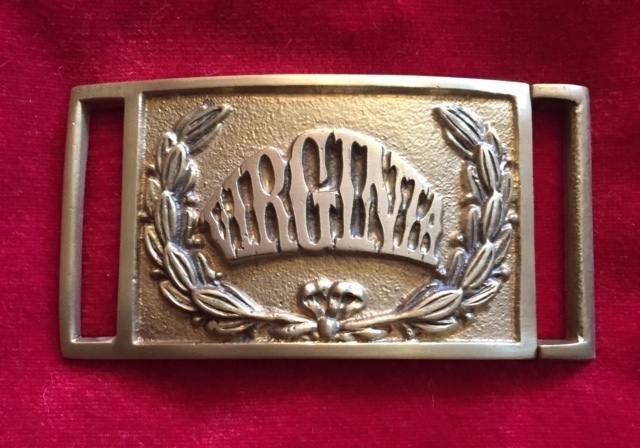 TG-1114 Virginia Two Piece Belt Plate. 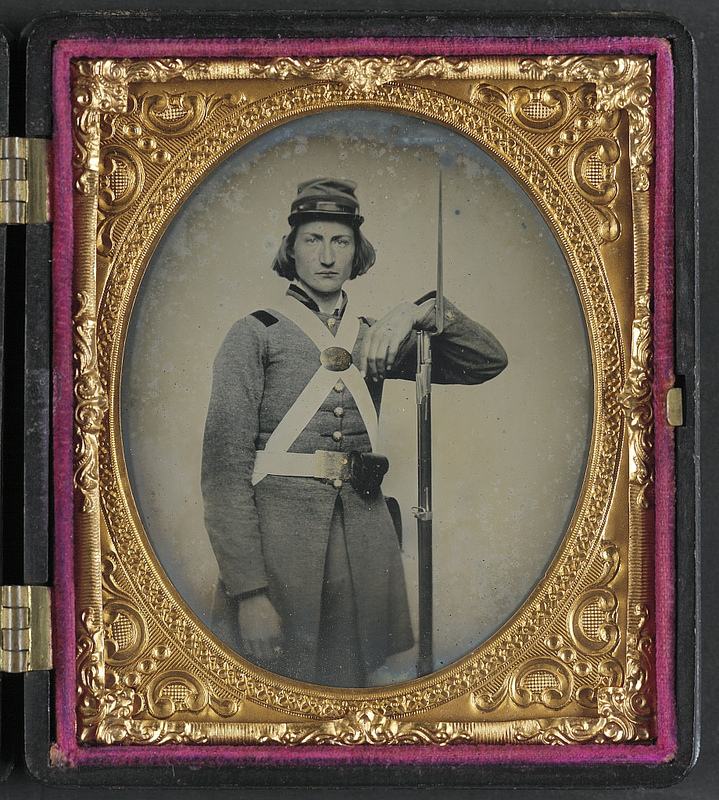 Circa 1861-1865. I cast this plate in nickel silver. 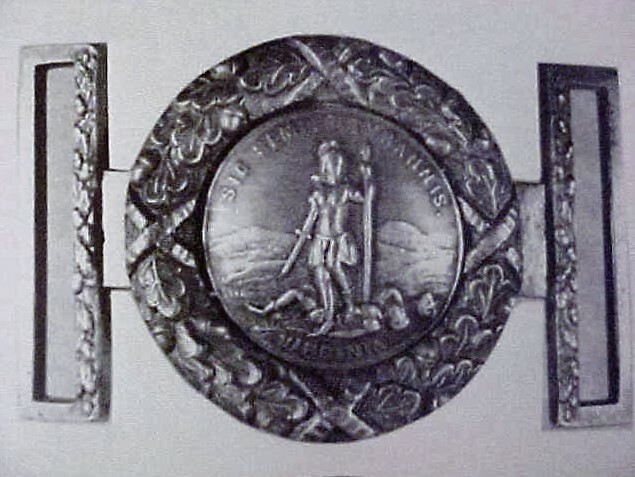 The original belt plate was cast in a Confederate Foundry. 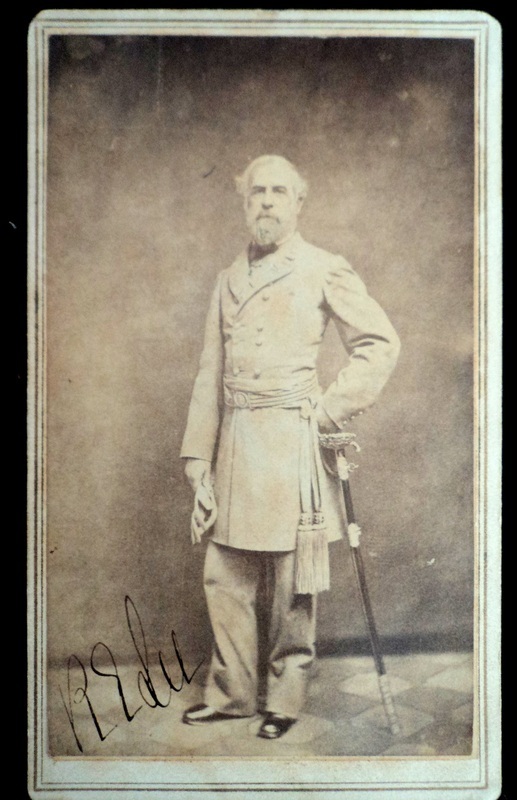 The original T-114 Virginia two piece above is a pre-war 1851 pattern made by J.S. Smith & Sons, New York. They are very close in design but the wreath is different. 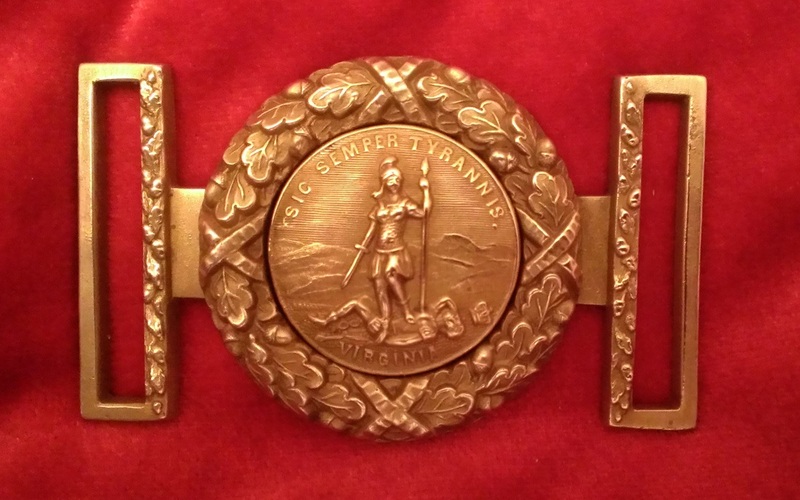 TG-114 Virginia Two Piece Belt Plate Original maker James S. Smith & Sons, New York. No design on the belt loops. 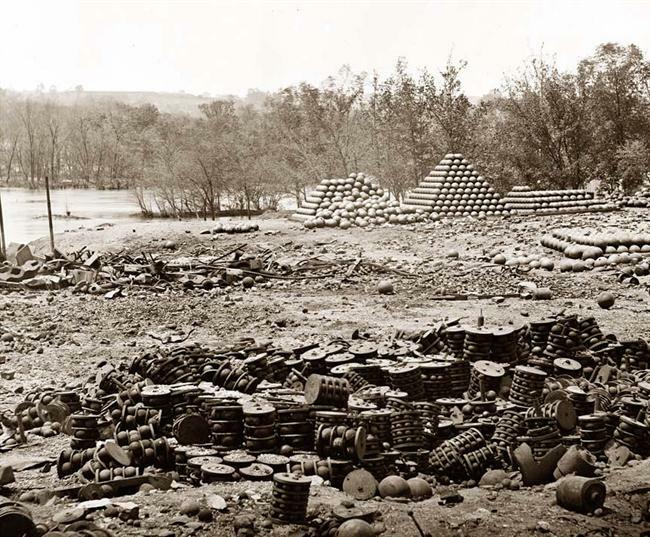 Smith's Confederate States dies were destroyed in 1861. 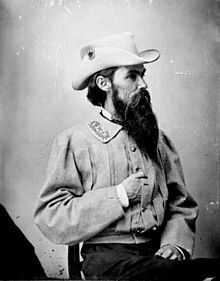 William Mahone's original belt plate and belt sold at auction. 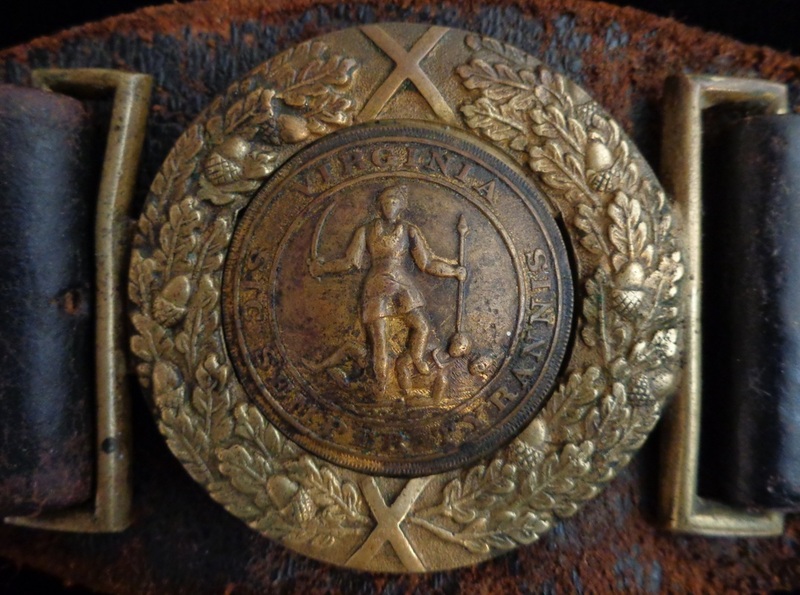 TG-MahoneTP Virginia Two Piece Belt Plate Circa 1861-1865 This Va Two Piece is Confederate manufactured, as compared to the G-83 which is 1851 pre-war manufacture. 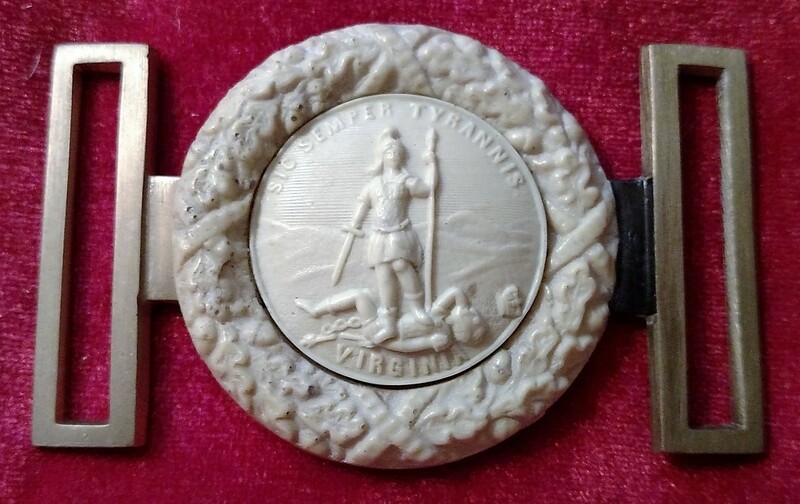 The difference is seen in the hand engraved Va seal of the TG-MahoneTP. Original Virginia Two Piece I used to cast the T-86 below left. 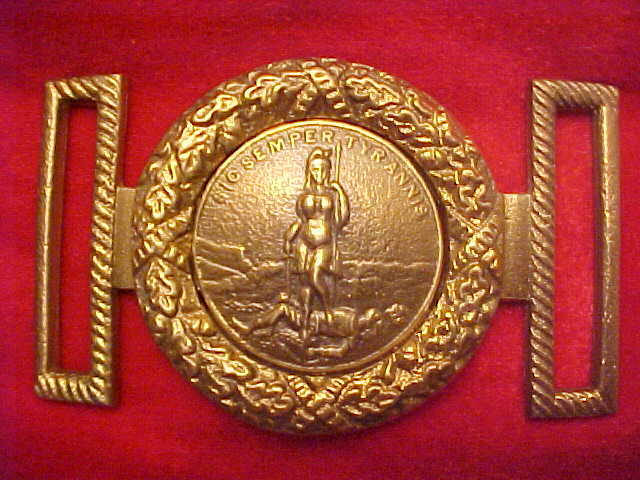 Stamped 28 and not on a belt when I cast the reproduction. TG-(VA.CSMASONTP) Virginia CS Mason Two Piece Circa 1861-1865. 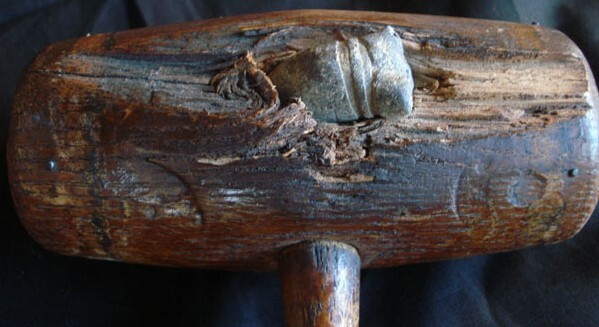 Cast in a Confederate Foundry. Very crude casting missing the detail but would have been this red brass . C.S. just did not have the ZINC to turn the red brass yellow. 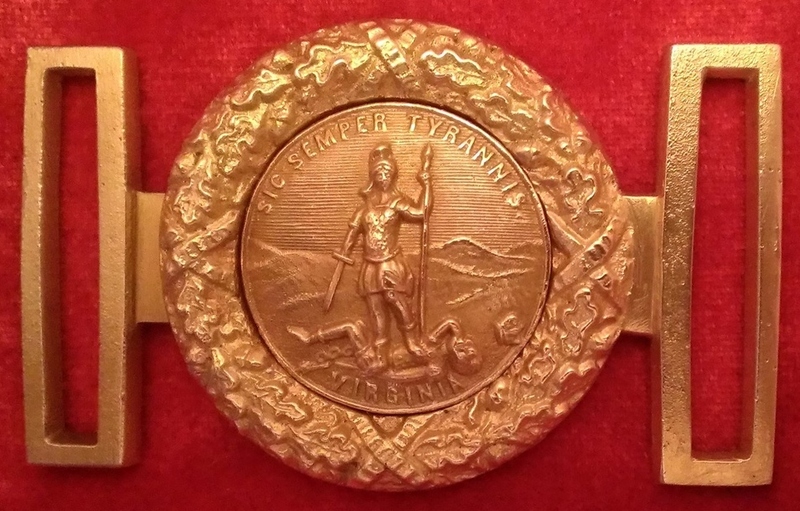 Virginia two piece original with gold plate used to cast the TG-86..
Rare original Virginia two piece. Same type as the TG-183VA pictured above the T-86. 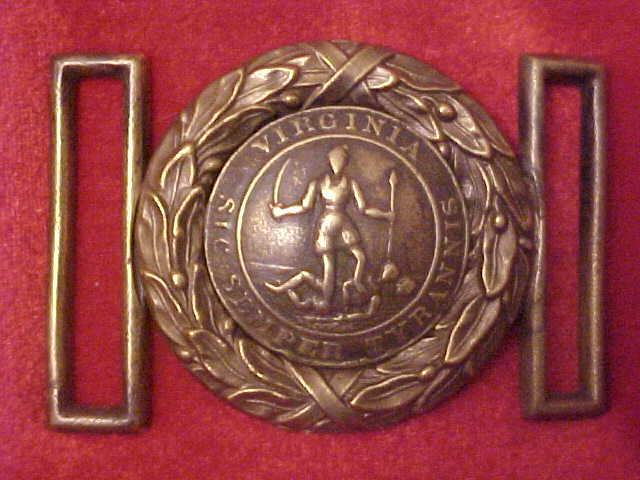 James Smith & Sons, New York cast many Virginia and other state buckles pre-war. 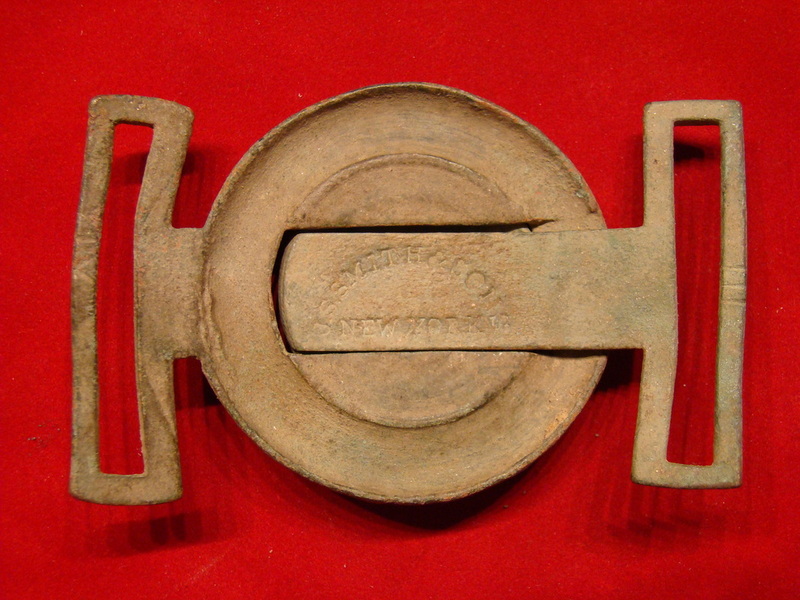 Confederate Foundries used his buckles as master patterns and most were very crude casting. 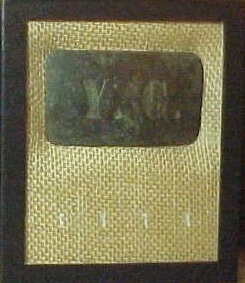 Original of the G-84 Virginia Two Piece. 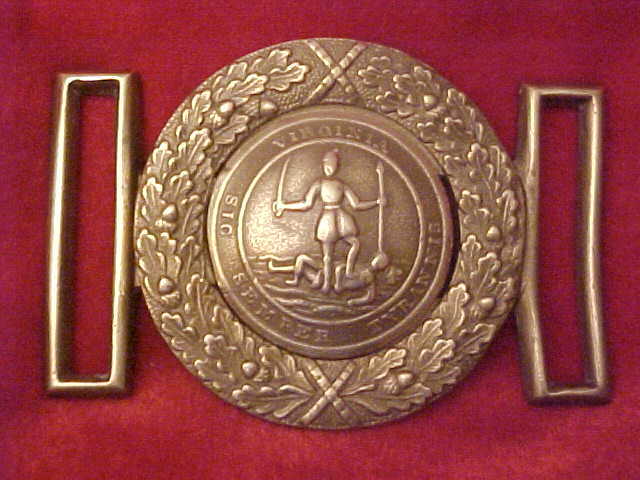 Applied disc on the belt bar. I cast this solid unless you order applied. 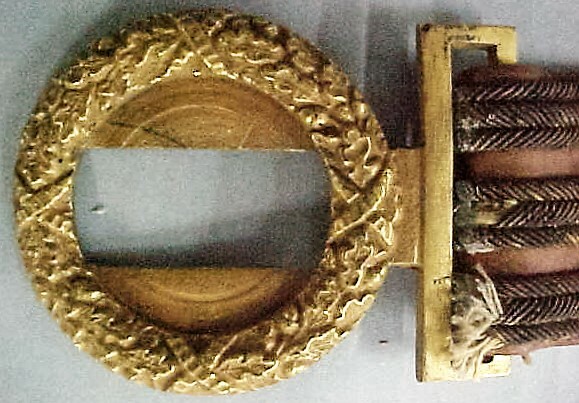 Tredegar cast buckles from cannon brass. 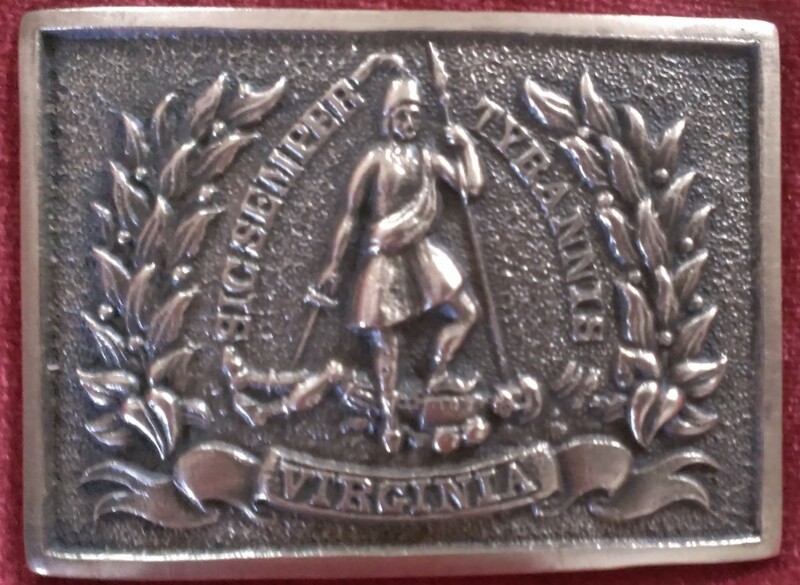 TG-VA82 Virginia Two Piece Belt Plate. Circa 1861. 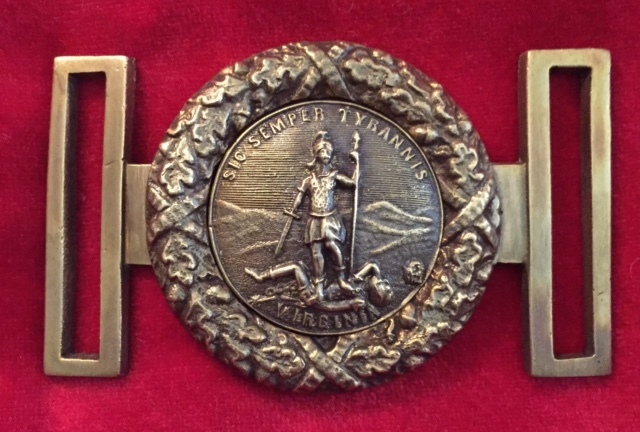 Has the same seal design as the T-116 Virginia Two Piece. 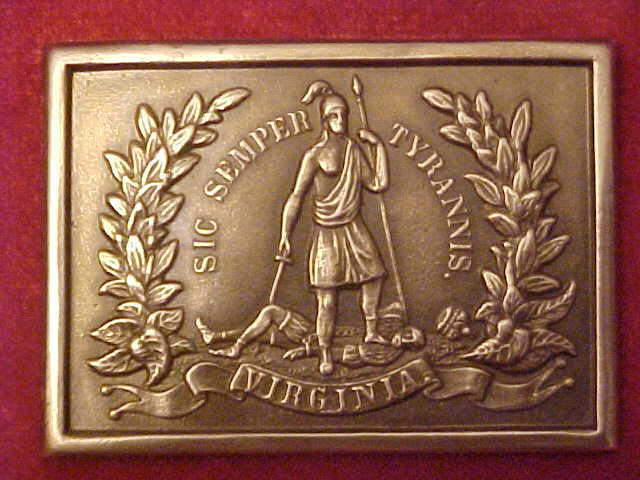 T -116 Virginia Two Piece Belt Plate. Some collectors believe this Va. to be Post War but sure looks period cast to me. Many turned up in Gettysburg in the post war years. 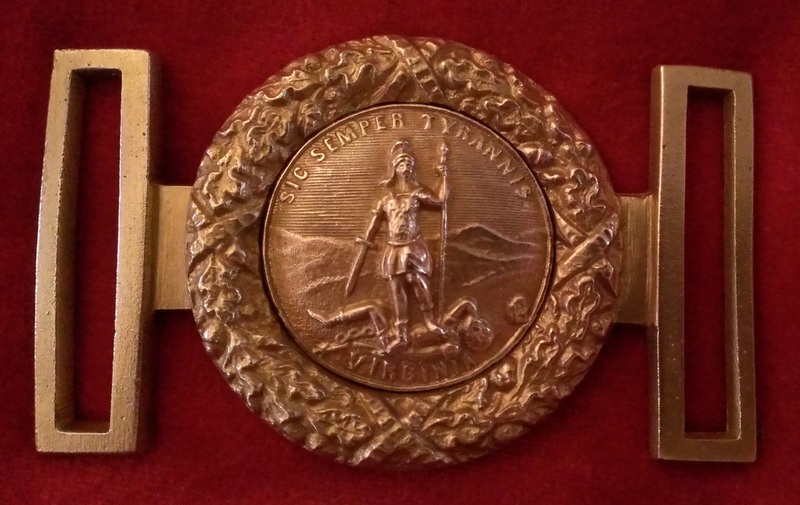 G-88 Virginia Two Piece Belt Plate Shown here cast from original civil war artillery shell brass sabot. Antique look. 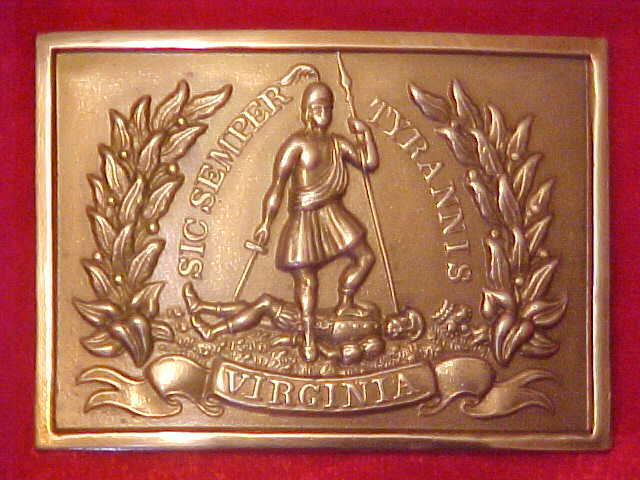 T -115 Virginia Two Piece Belt Plate. 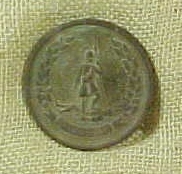 (applied center disc) Circa 1851 Maryland-Steuart Collection. 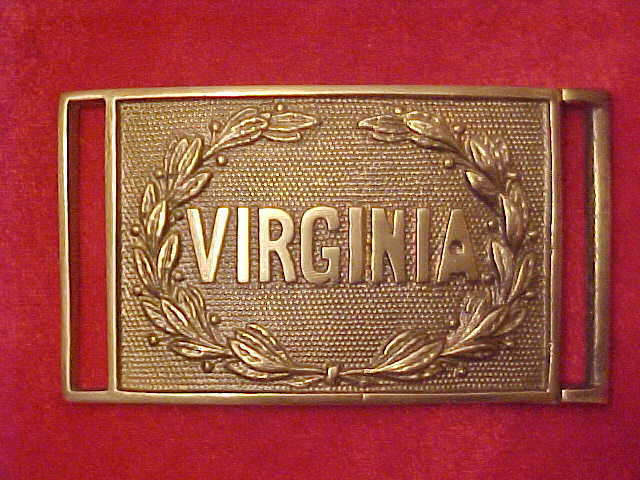 TG-2115 24kt Gold Plate Virginia Belt Plate. 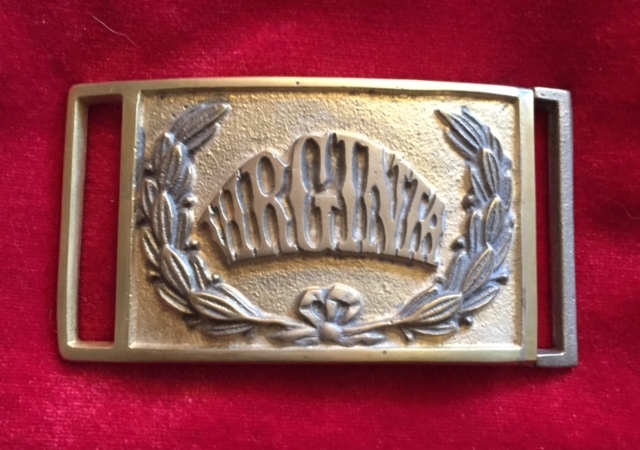 Ask about our Gold and Silver plate on any buckle we cast. 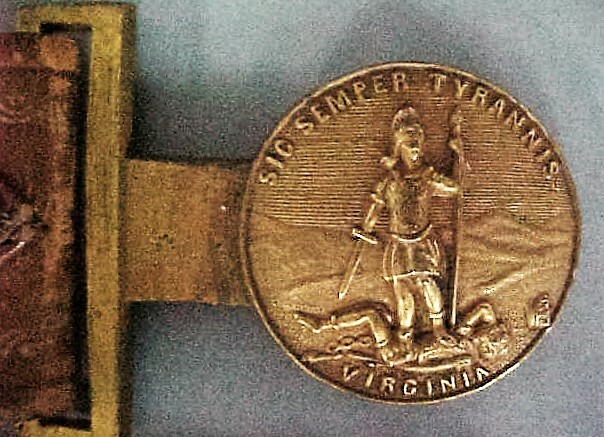 TG - VMI Two Piece (Post War) Spear point down makes this Virginia seal post war. 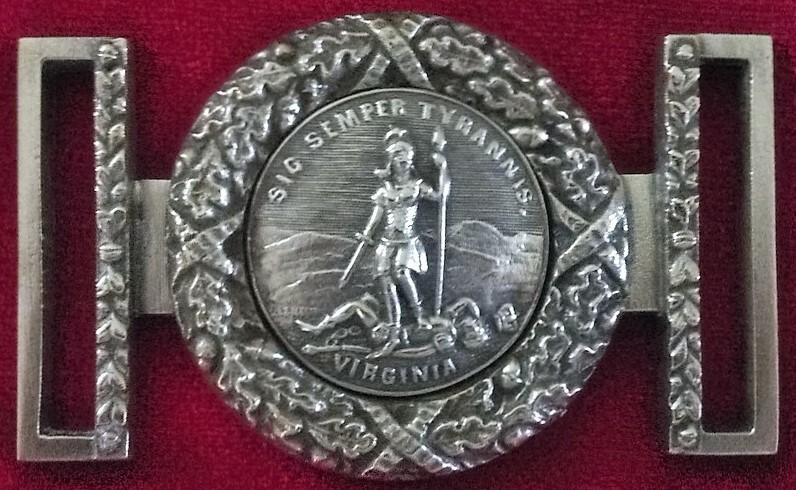 TG-121 Virginia Breast Plate "original look with the pin type attachment"
TG-Ames2 Virginia Two Piece Belt Plate. Circa 1861. Not cast this way, just to show difference in color red and yellow metal. Virginia Cavalry ready for battle. 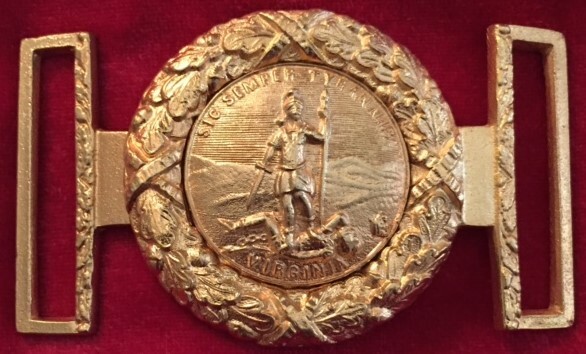 He is wearing a Virginia Sword Belt Plate. T-120 1st. 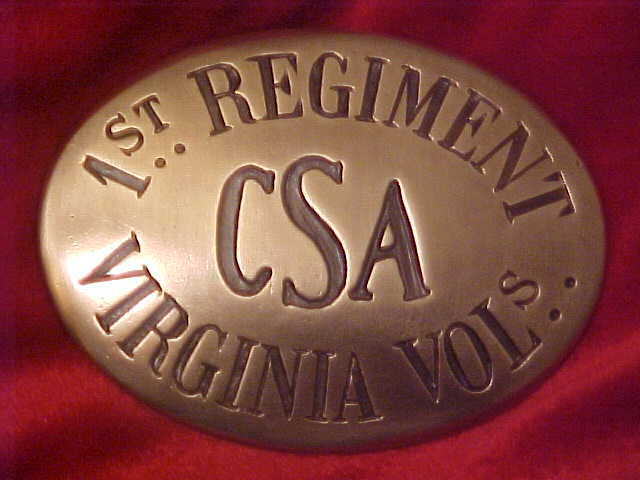 Regiment Virginia Vol's. 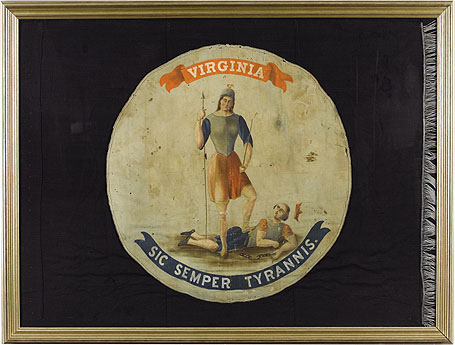 (CSA) Circa - 1861-1865. 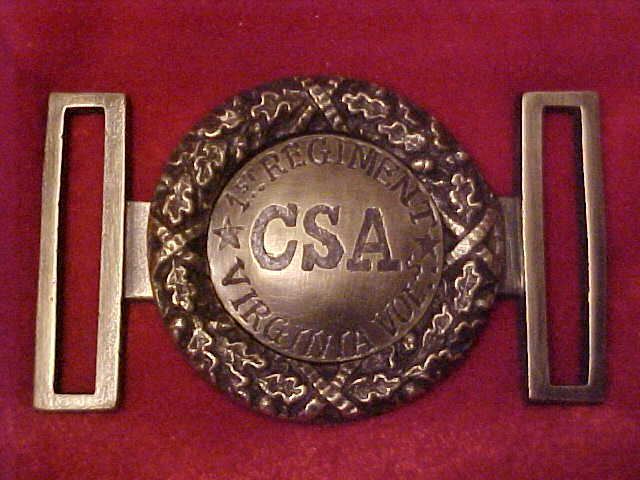 The CSA was engraved later, not when cast. Only a couple of this type know. 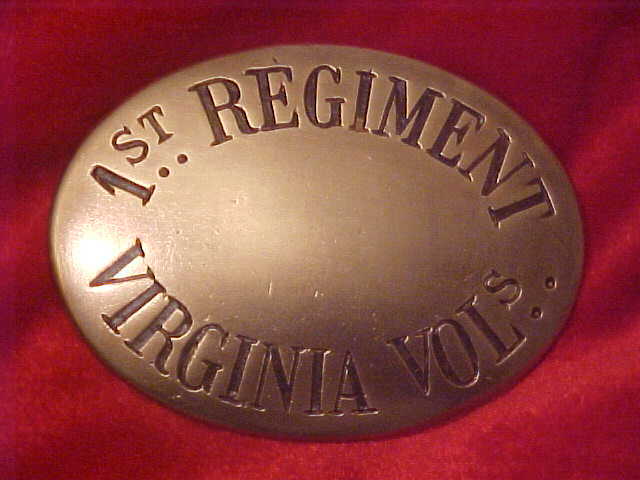 Virginia Confederate wearing the T-121 Virginia Breast Plate. 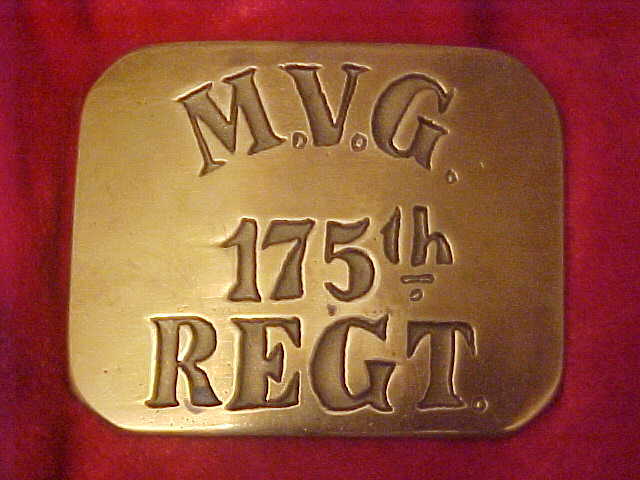 TG-112 (Virginia Post War) Virginia Belt Plate cast solid brass not stamped 1870. 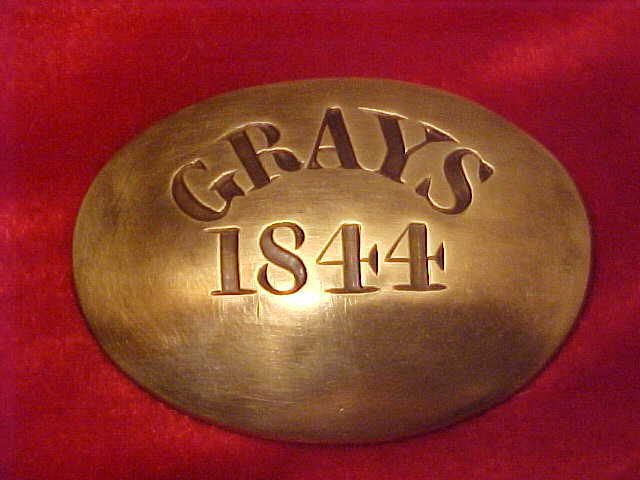 G-94 Richmond 1844 Grays Cross Belt Plate Maryland-Steuart Collection Virginia Historical Society Cast as breast plate with pin or buckle. 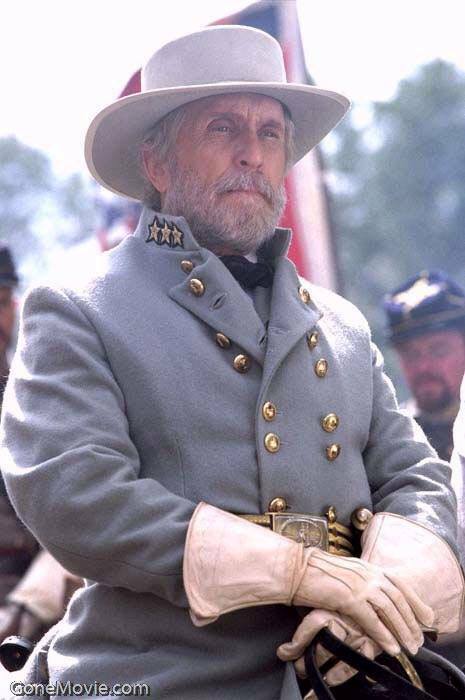 Original Virginia Cross Belt Plate dug Cold Harbor, Va.
Robert Duvall is Robert E. Lee in "Gods and Generals" and on his sword belt is the T-111 Virginia. 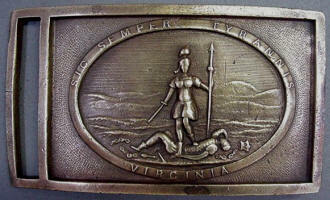 I think Lee would have worn his two piece Virginia, not a Virginia sword belt plate. 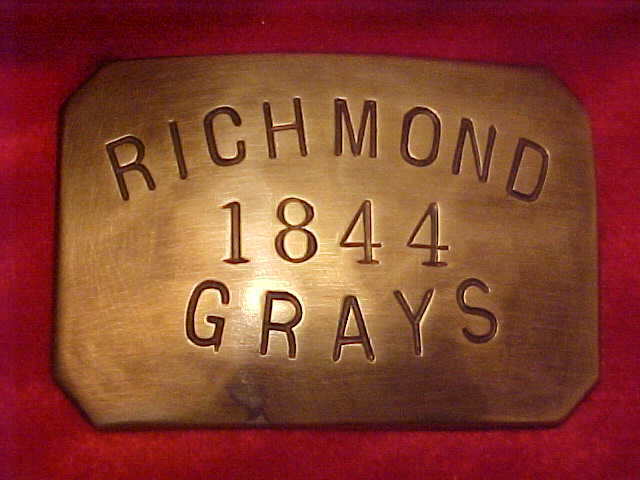 G-93 Richmond 1844 Grays Belt Plate Maryland-Steuart Collection Virginia Historical Society Cast as plate with pin or buckle. 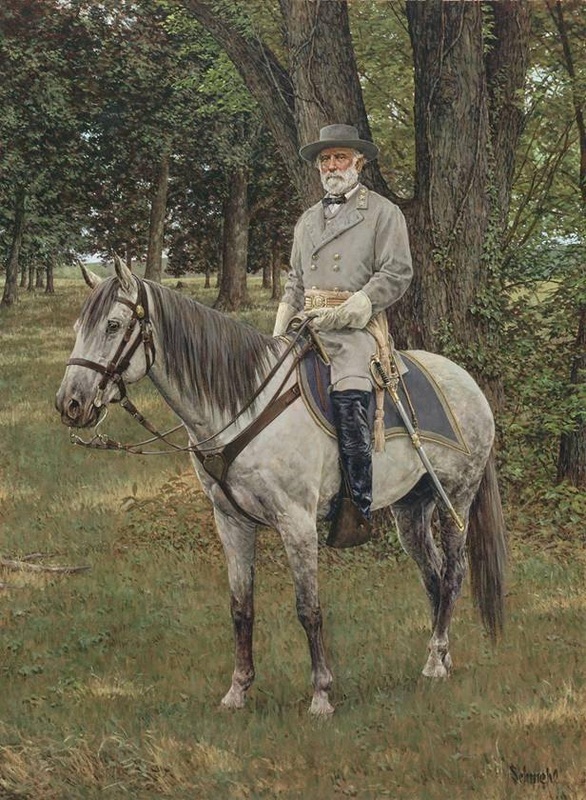 Confederate wearing the G-93 and G-94. 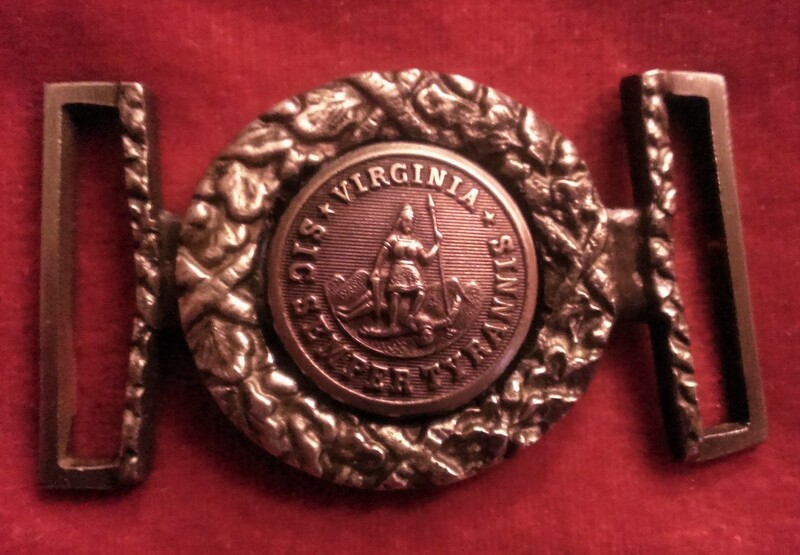 Original Virginia/wreath sword belt plate made in England and run the blockade. 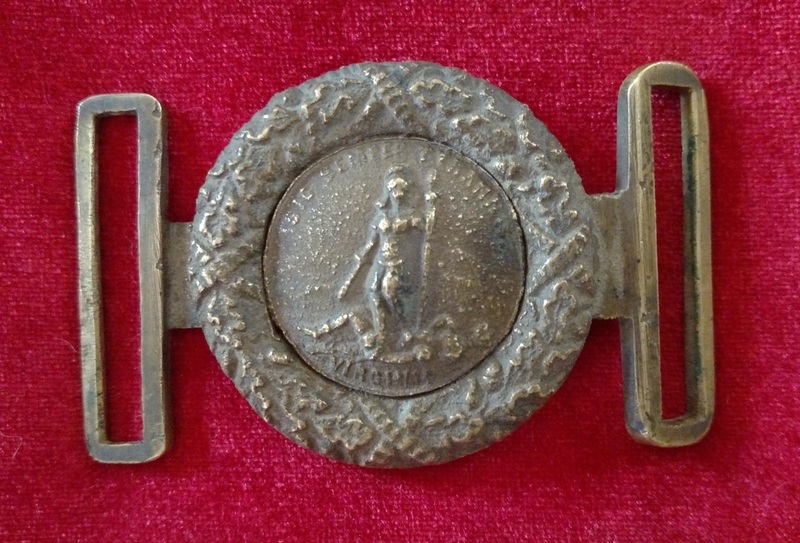 Some dealers say this buckle is post war but I know of three dug examples. 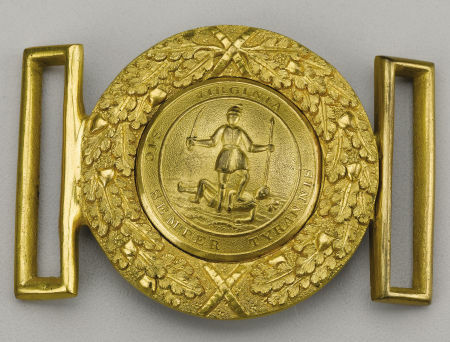 No question this buckle was used 1862. 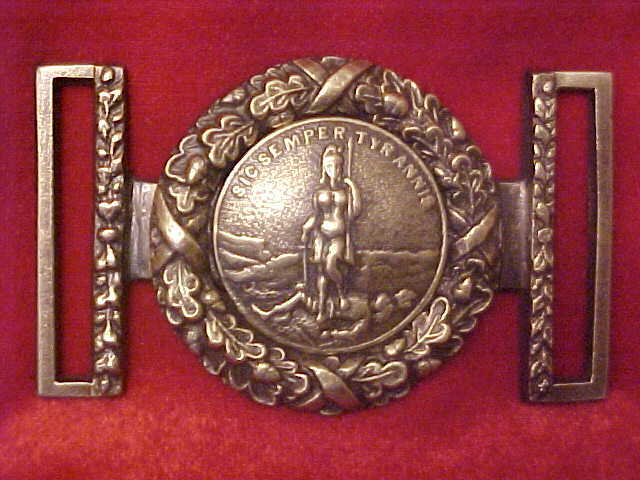 Beautiful well made belt plate. 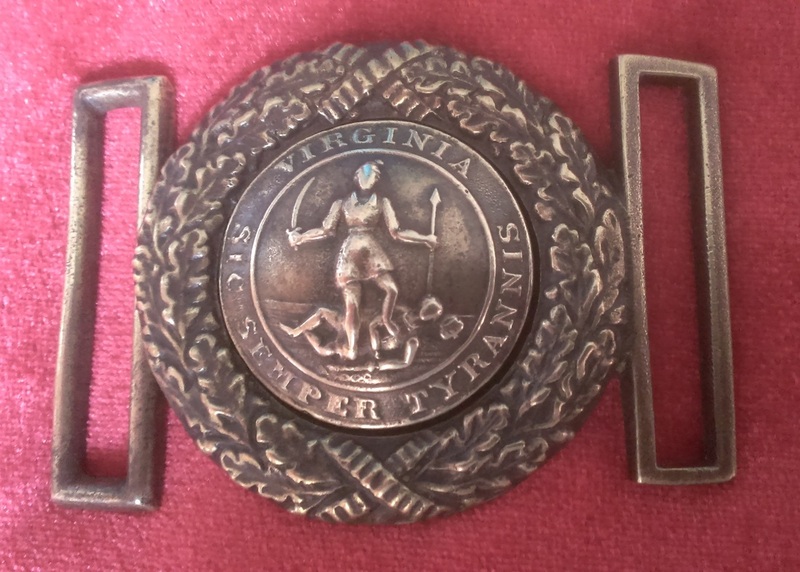 T-112 Virginia Belt Plate (maker William Smith, New York) T-112 can be ordered with original style belt bar & tongue or 3 hooks. Also D-loop modern style. 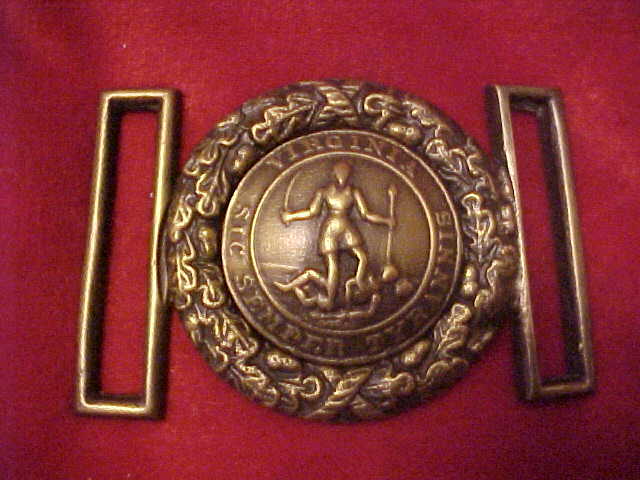 G - 92 Virginia Belt Plate (maker James S. Smith & Sons, New York) G-92 can be ordered with original style belt bar & tongue or 3 hooks. Also D-loop modern style. TG-BeltKeeper. 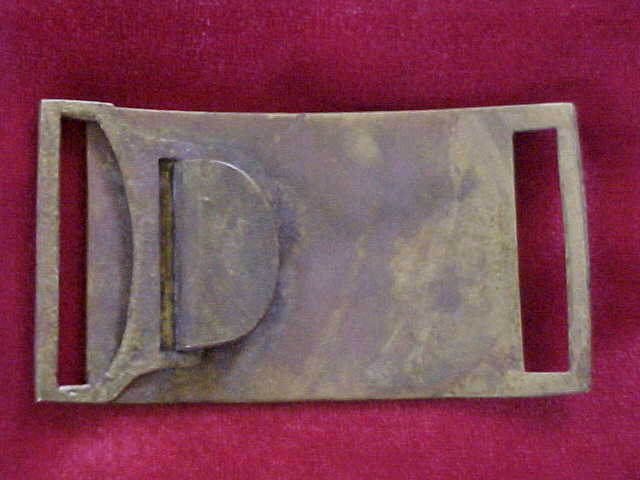 Pre-War Belt Keeper for all die struck plates. 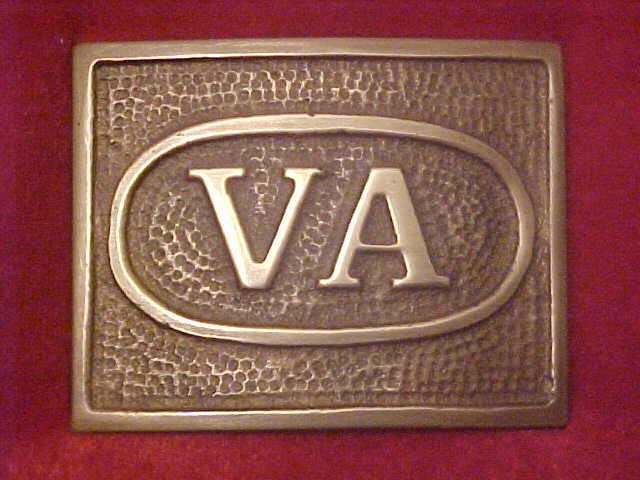 G-91 Virginia Belt Plate. Solid Brass. 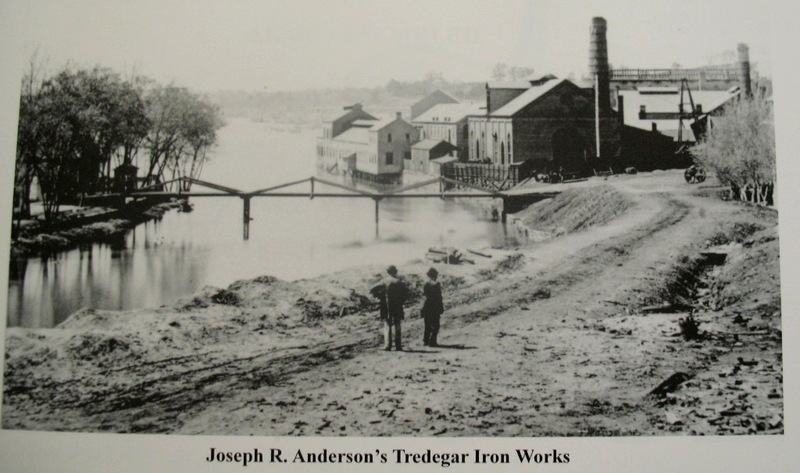 Circa 1861-1890. 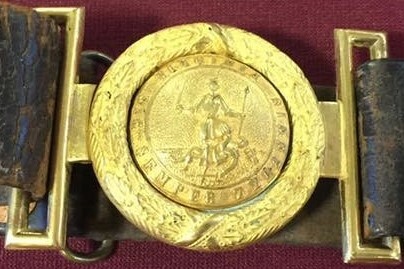 Used by Military Schools. 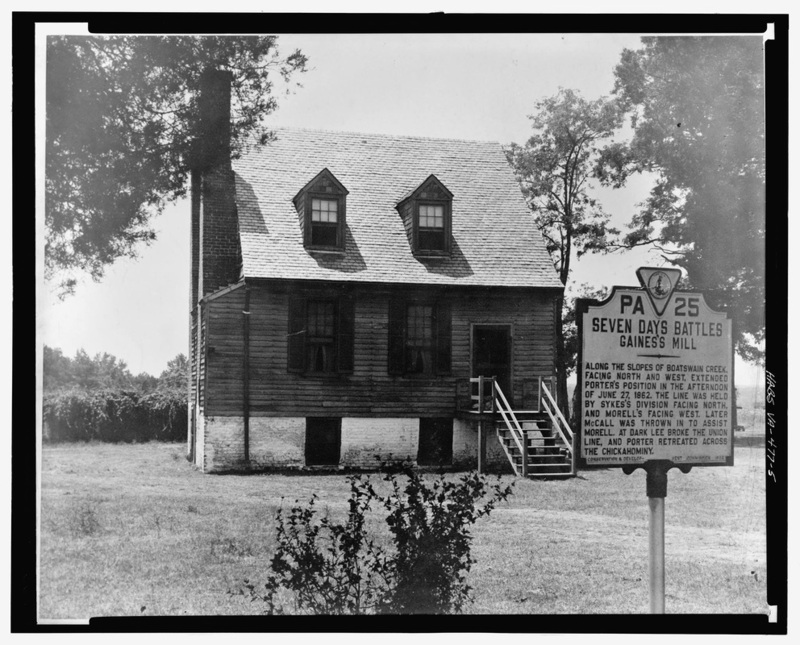 "Gaines Mill Battlefield" Seven Day's before Richmond, 1862. Original type back for the TG-110 pictured below. 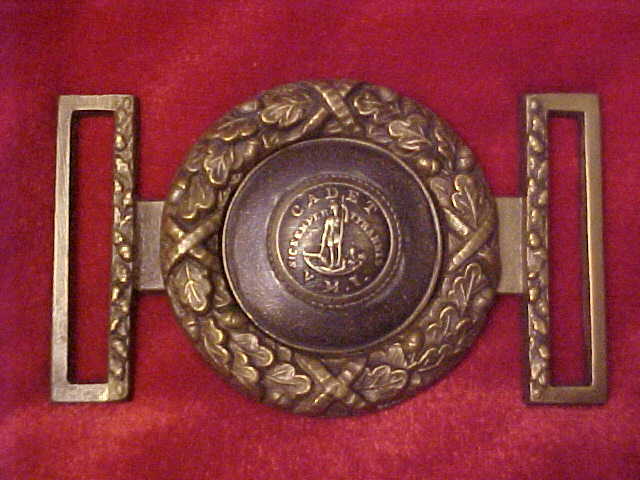 Wide hook is correct for this type belt plate circa 1861-1865. 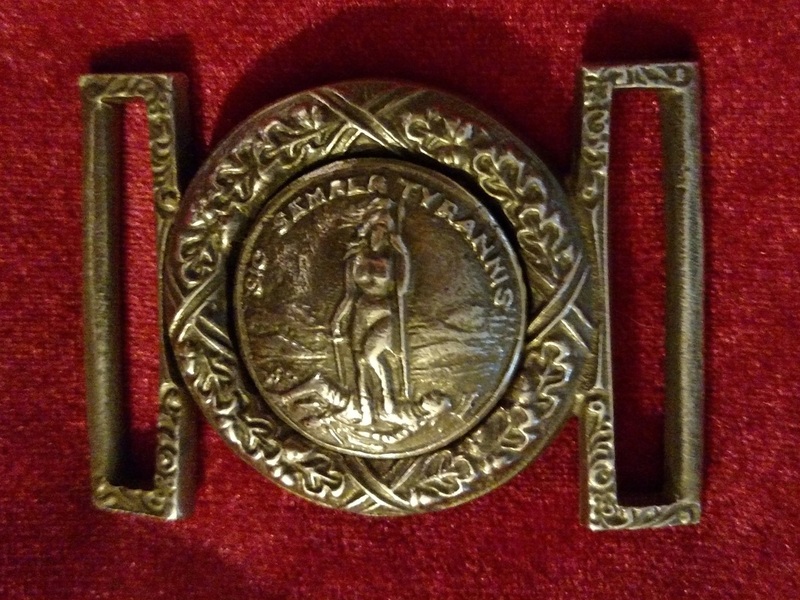 Wide front keeper hook does not make these buckles post war. 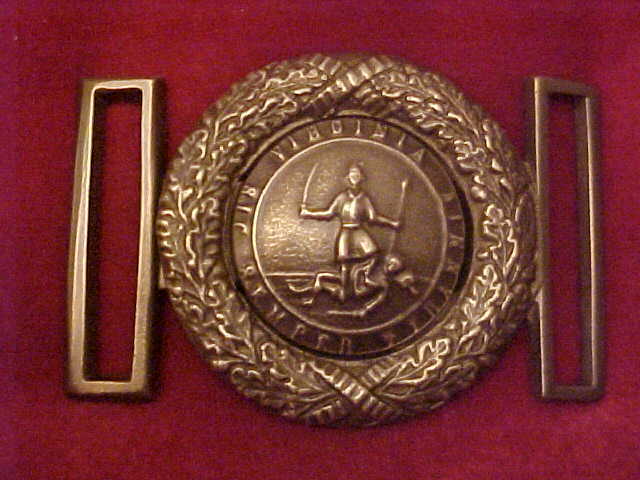 T-111 Virginia Sword Belt Plate back with belt keeper. 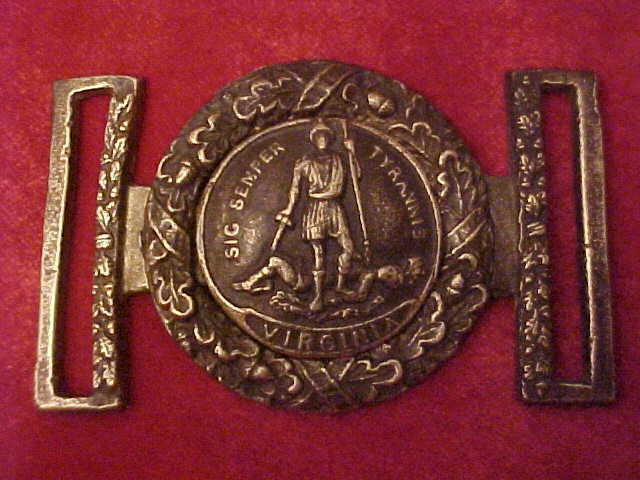 Original Virginia Sword Belt Plate on the leather belt. 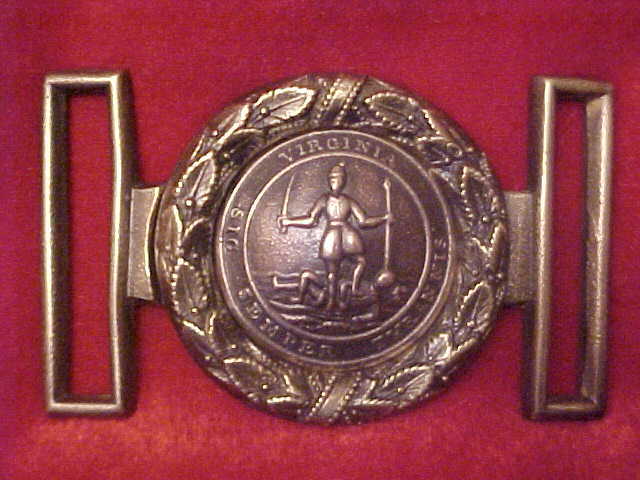 Virginia Sword Belt Plate (29) This Virginia Sword Belt Plate is original. 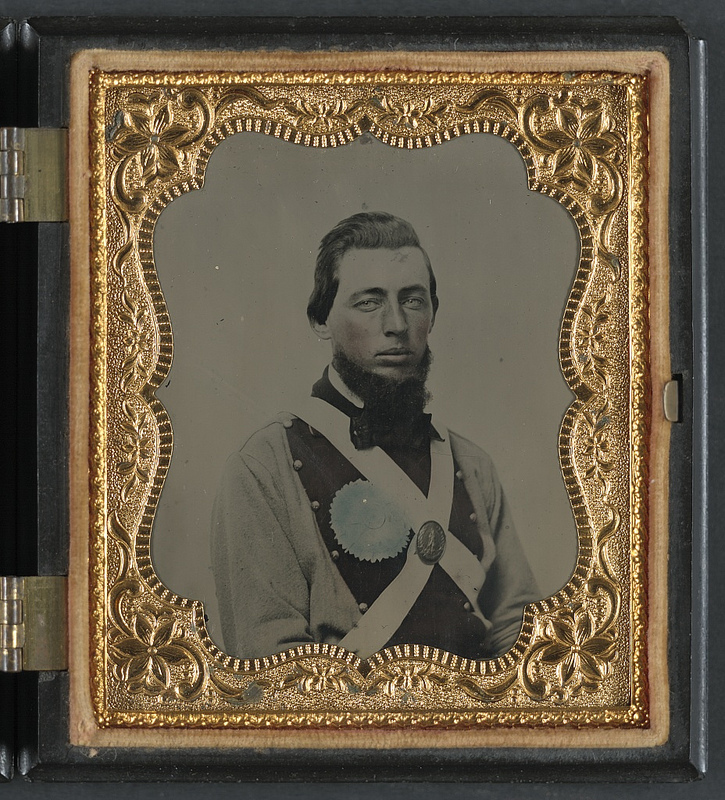 Harry Ridgeway has this plate shown on his fake section as a fake but it is original. 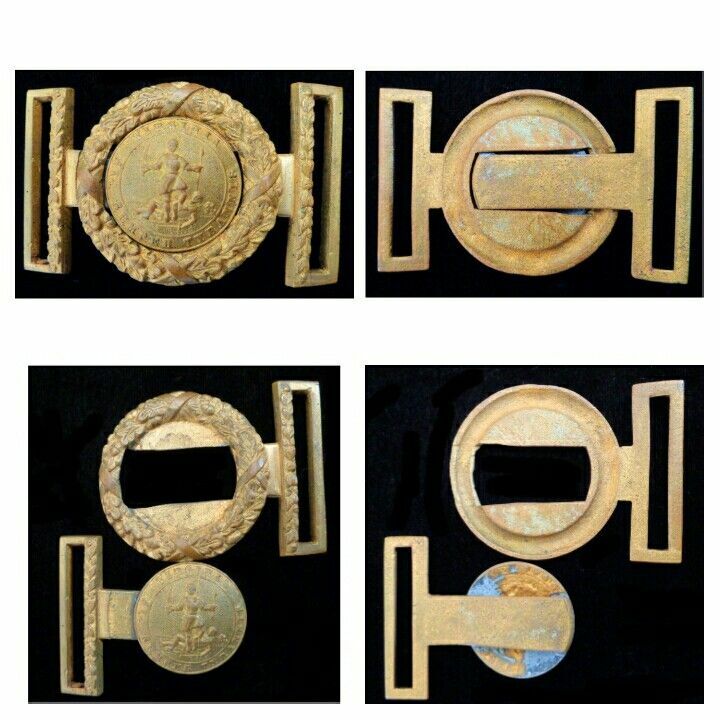 Also he has several other belt plates listed as fake that are original and some that are original are fake. 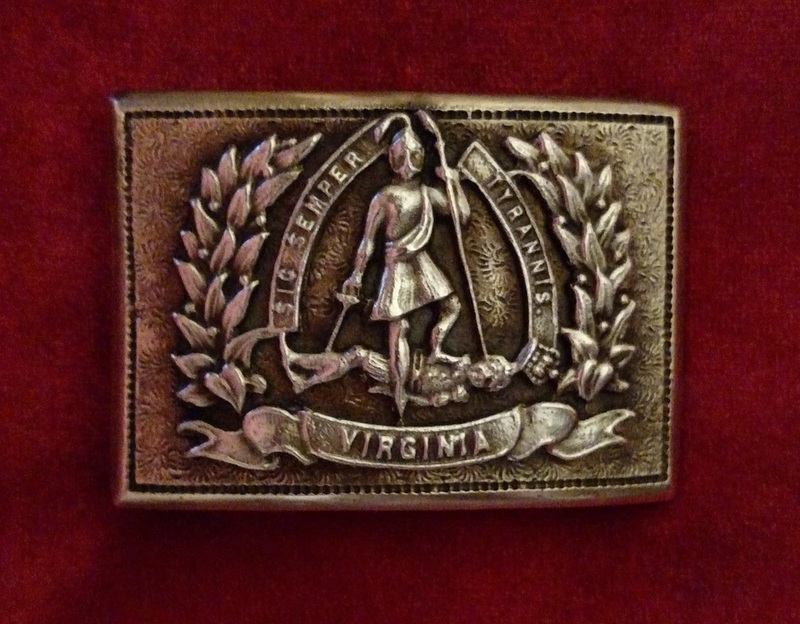 I bought the Virginia buckle and I took the applied hook off to photograph how these were made. Had to use a 750 degree heat to drop the hook off and also to braze it back. This changed the original color so all of a sudden it is fake. I told this story over and over but with little interest. 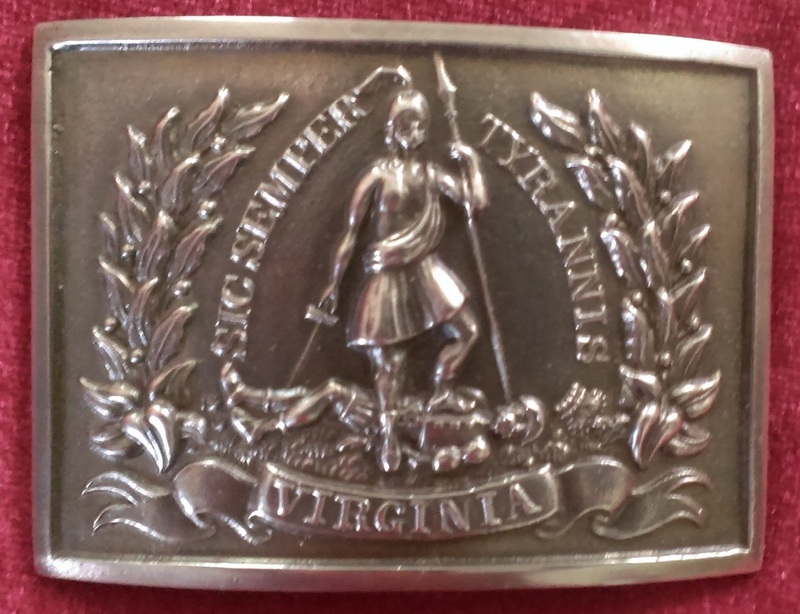 This Virginia is original, I did change the buckle color and hook size. A original Virginia trashed because of this dealers hate for me. 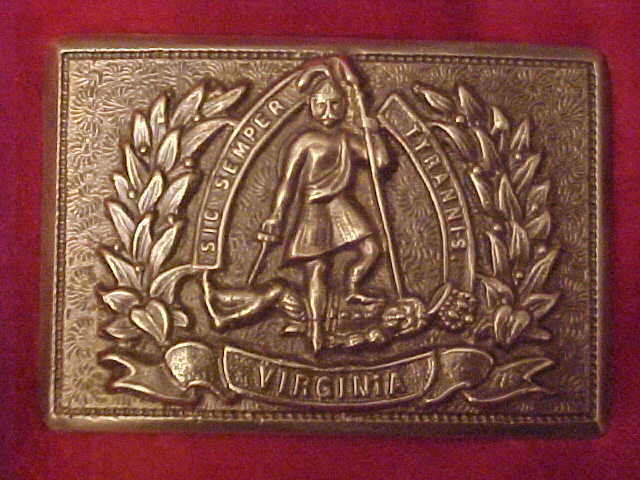 "Stonewall Jackson" wearing the T-111 Virginia Sword Belt Plate pictured above. 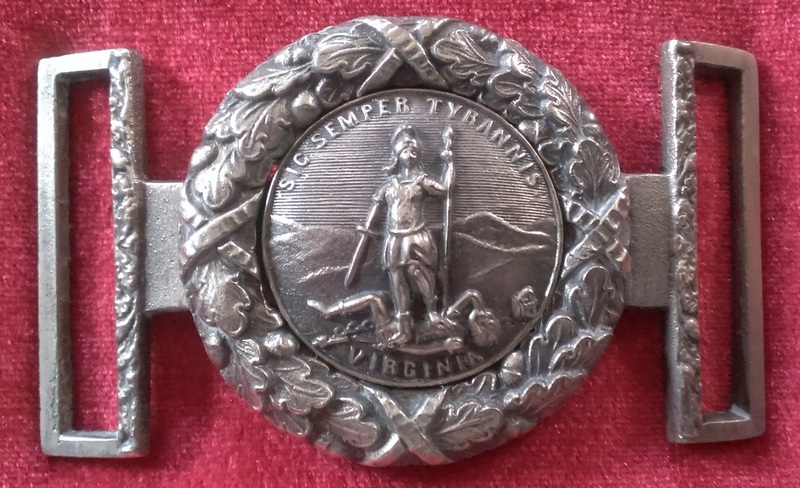 TG-110 Virginia Belt Plate (original style with silver plated Wreath and Virginia) also the correct wide hook and keeper. TG-Y.G. 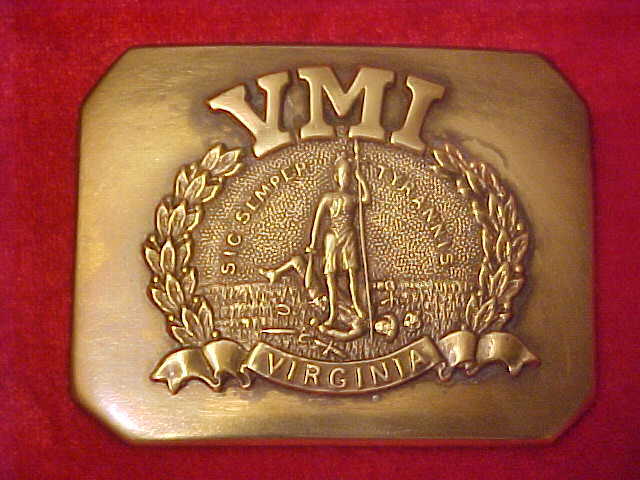 Young Guard Belt Plate (15th Virginia Infantry) original dug Malvern Hill, Va.
TG-MVG Mount Vernon Guard Belt Plate (Alexandria,Va. 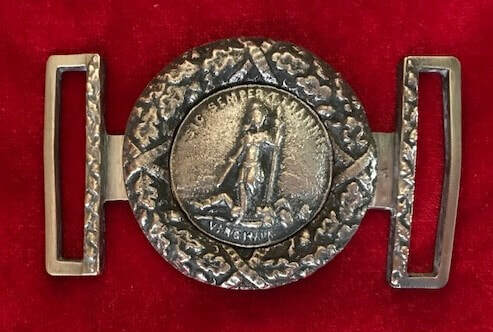 unit) dug Massaponax Church, Va.
TG-Lee/3star Robert E. Lee (3) Star Sword Belt Plate Statue of Lee in the Virginia State Capital wearing this "three star buckle." TG-VACOATBUTTON Virginia One Piece Button. (Silver Plate) solid cast. Minie Ball in a tree made into a Gavel. 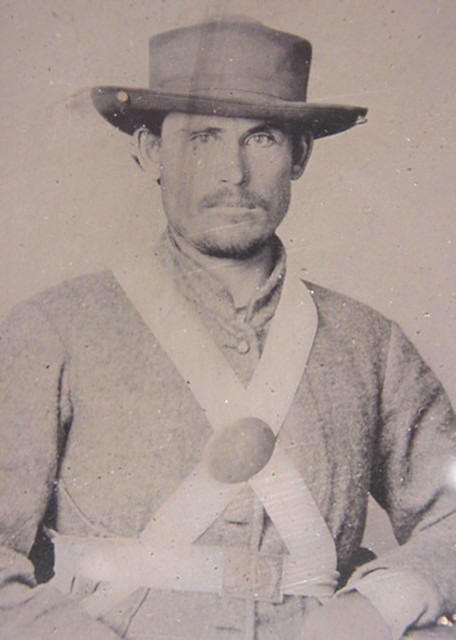 Original photo of Lee wearing the "Three Star Sword Belt Plate"
TG-1800VA. 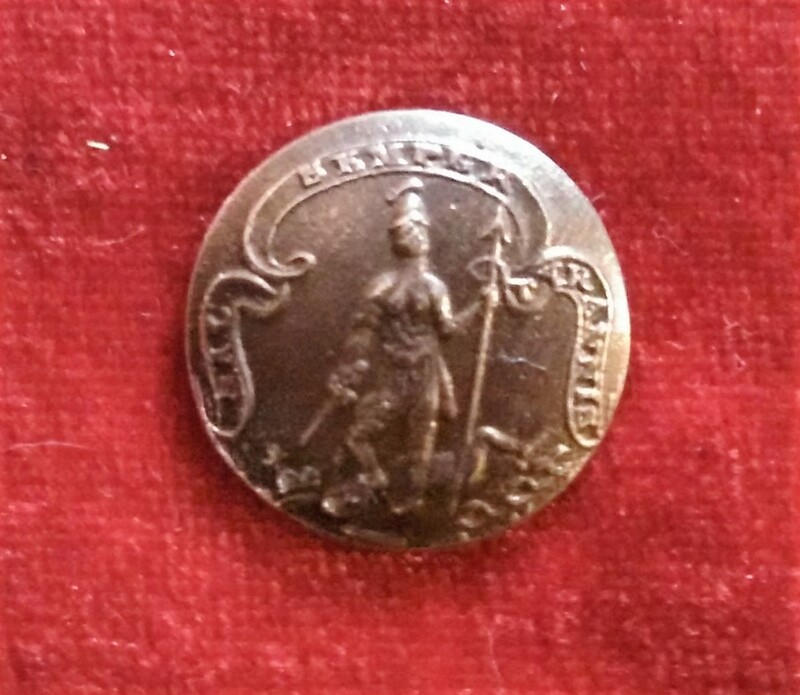 Late 1700-Early 1800 Virginia Coat Button. 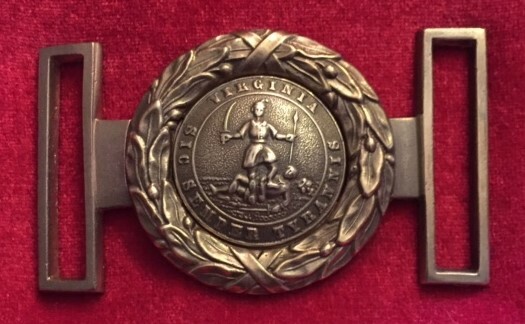 Statue of Lee in the Virginia State Capital wearing this "three star buckle." 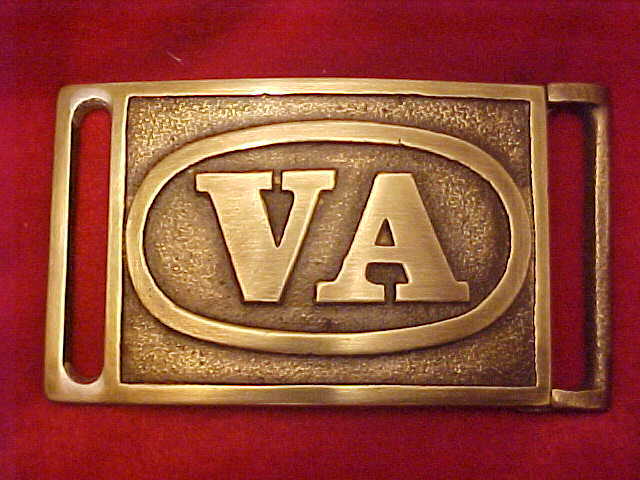 G-91B Virginia Belt Plate. 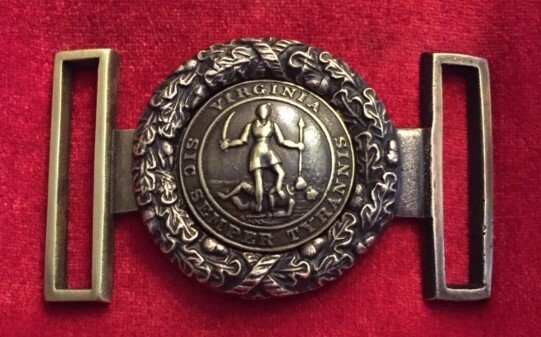 Applied nickel silver Virginia State Seal. 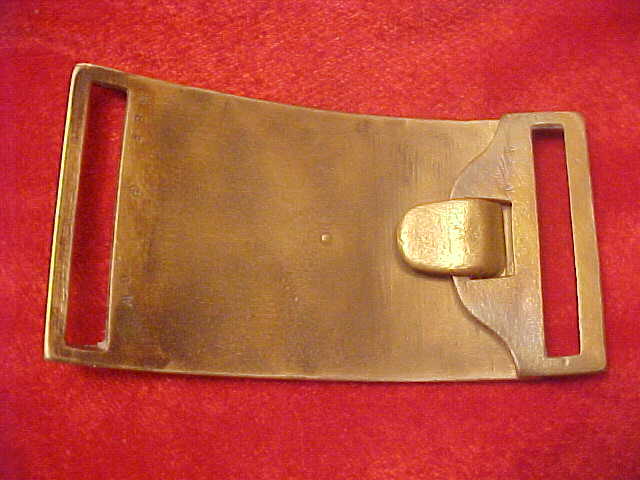 Yellow brass rectangle buckle. Cast just as the original. Circa 1861-1890. 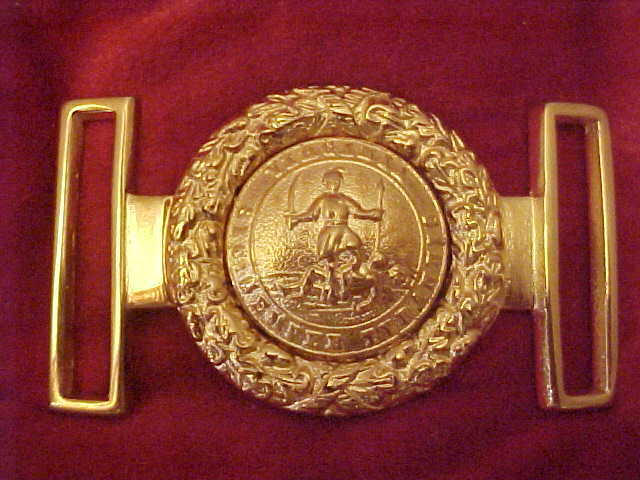 Used by military schools. 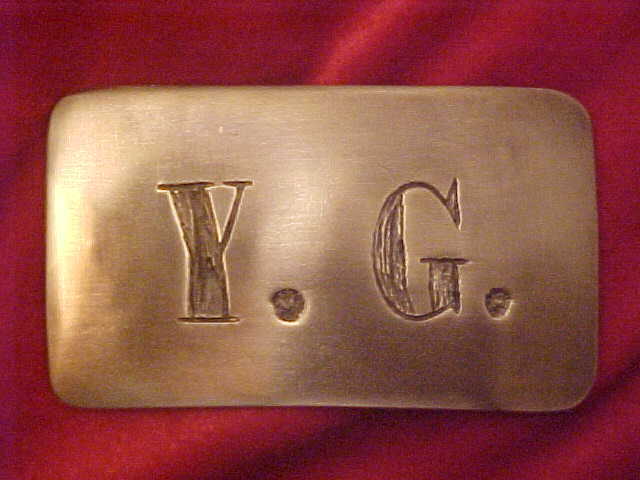 Original Young Guard Belt Plate used for the master pattern TG-Y.G. Original dug Malvern Hill, Virginia battlefield. 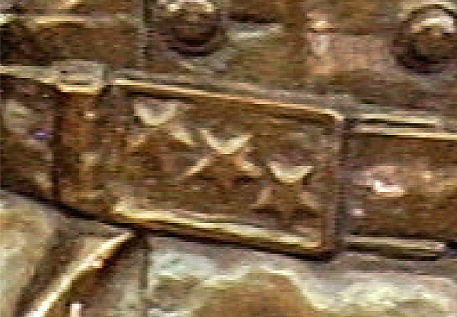 Three Star Belt Plate on the Statue of Lee. My Cold Harbor collection thirty five years ago. A great life of relic hunting. 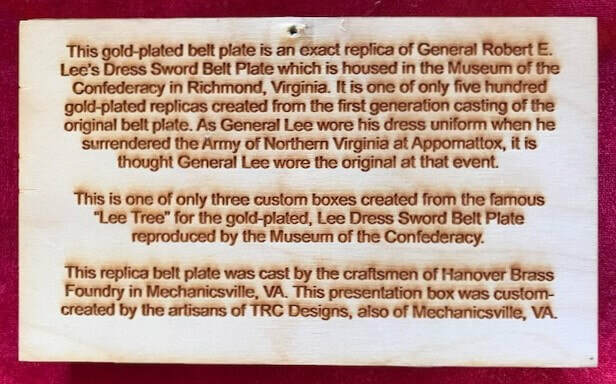 TG-Lee - General Robert E. Lee Two Piece Belt Plate. Type worn by Lee and beautiful Confederate cast detail. 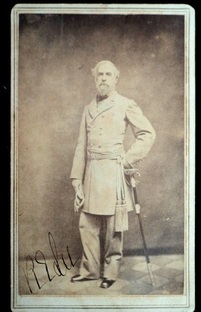 Circa 1861-1865. Confederate Flag Room, The Museum of the Confederacy. Tom, Gary and Gary Jr. getting ready to open the rubber molds of the Lee and Stuart buckles on the table. 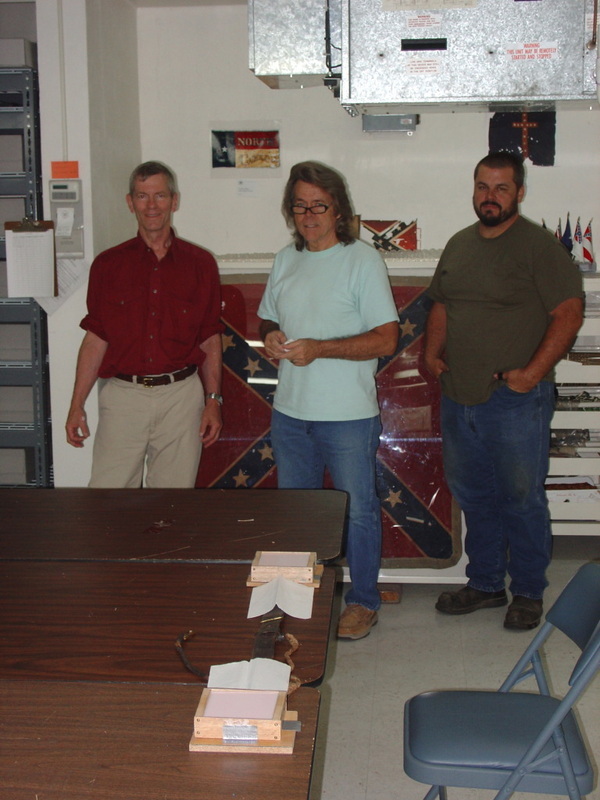 We are standing in front of a beautiful Confederate battleflag. More than five hundred Confederate flags in this room. 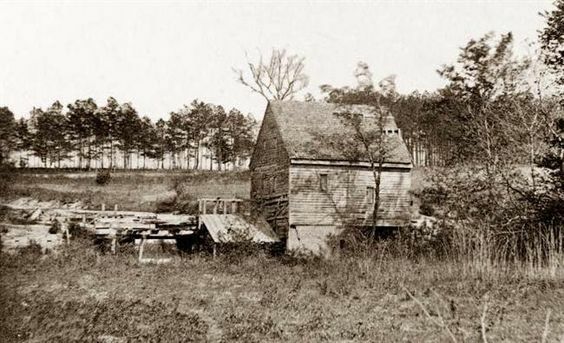 Seven Days' Battles 1862 Gaines's Mill, Watt House Hill. 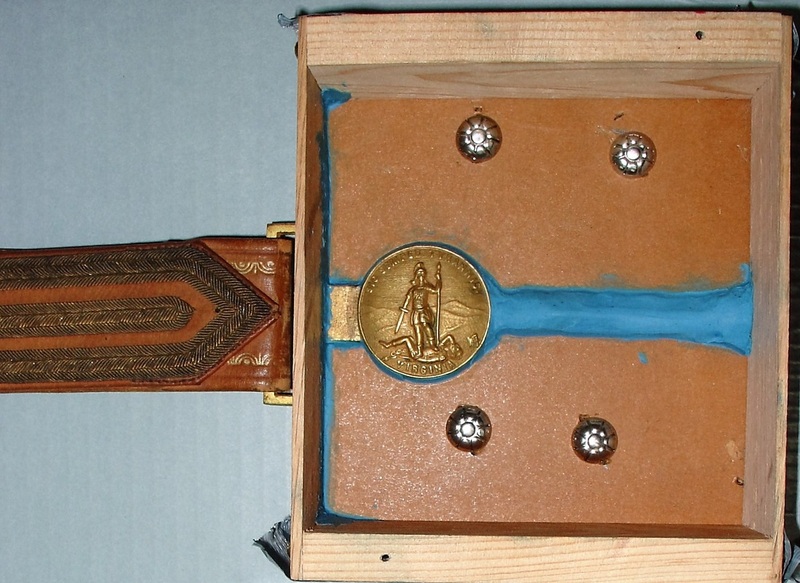 Lee's original tongue Virginia seal two piece to make the rubber mold. Virginia tongue seal in the wood box to pour the rubber. 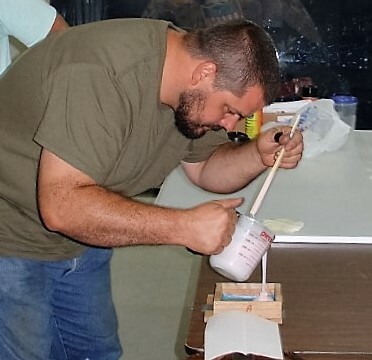 Tom mixing the rubber to make the mold for the Lee Virginia belt plate. Gary Jr pouring the rubber over the Lee buckle. 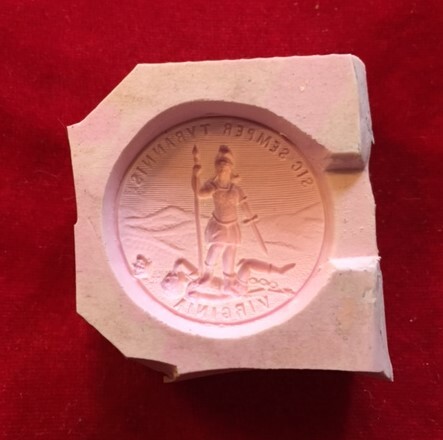 It will take twenty four hours before we open the rubber mold and take out the Lee original Virginia seal. 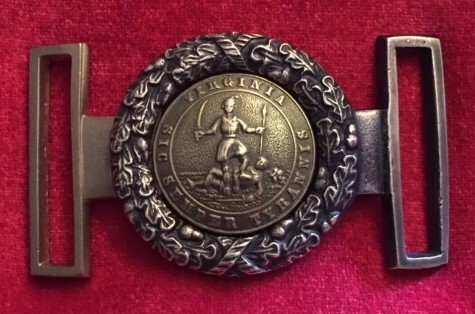 Lee's Virginia seal tongue and belt bar. When the belt plate is on the original belt you need to make the belt bar and apply to the bar. 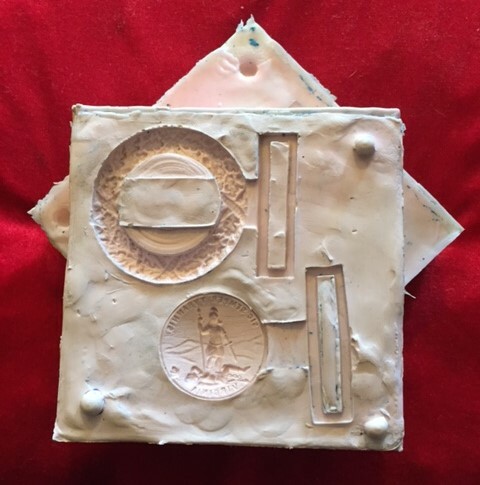 After the rubber sets you have the Lee belt plate rubber mold to make the master pattern. I use gun grip resin to make my master pattern from the rubber mold. 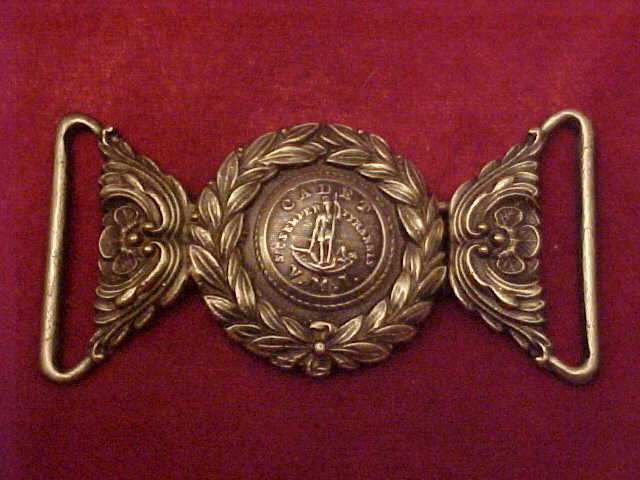 I add a brass belt loop on each side to complete the buckle. You use the same steps to make the rubber mold for the original Lee wreath. 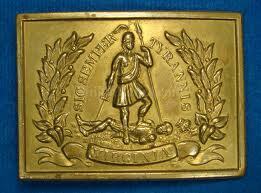 all this work and you have your brass Robert E. Lee Belt Plate. 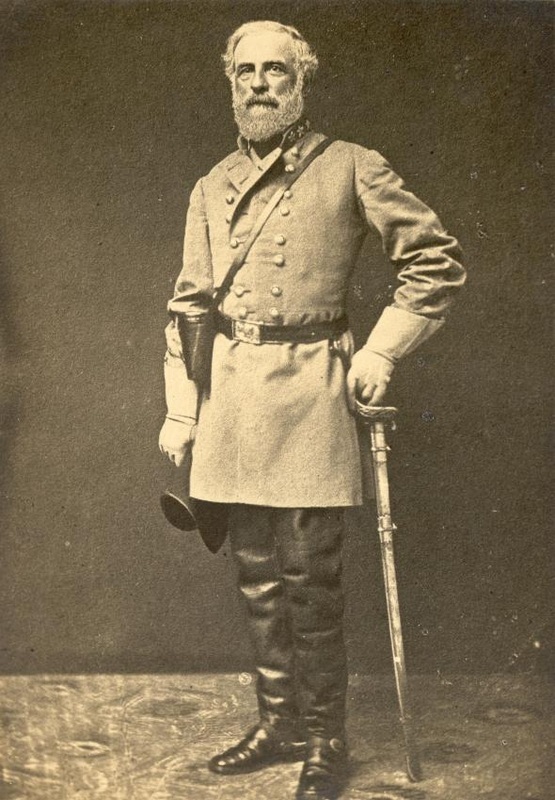 Gen. Lee wearing his Virginia two piece I reproduce. 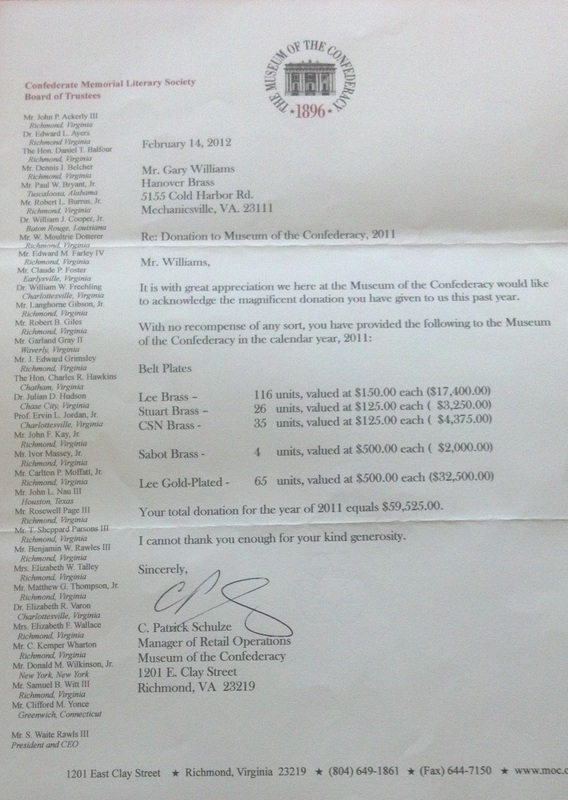 The first year sold, 2011 at the Museum of the Confederacy The Lee reproduction made the above donation from GW.